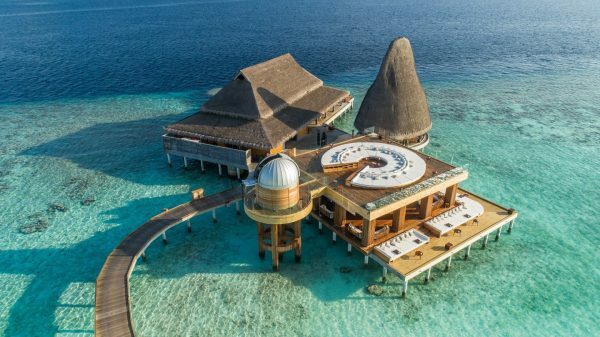 The Maldives is home to endless coconut trees, white sandy beaches and one ama-zing hotel. 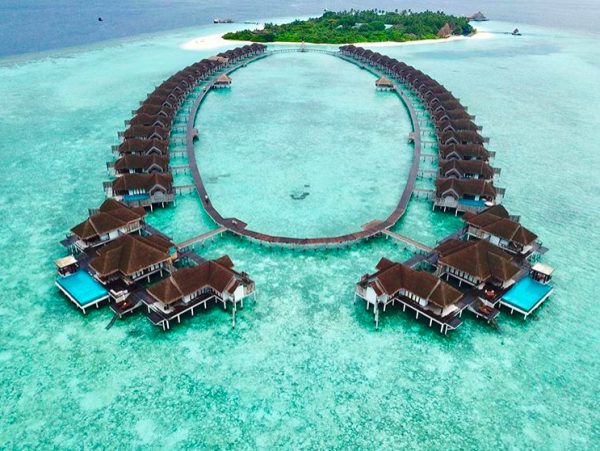 Looking at the photo’s, it’s no wonder that Anantara Kihavah Maldives Villas has been voted Most Instragrammable Hotel in the World by Luxury Travel Advisor. 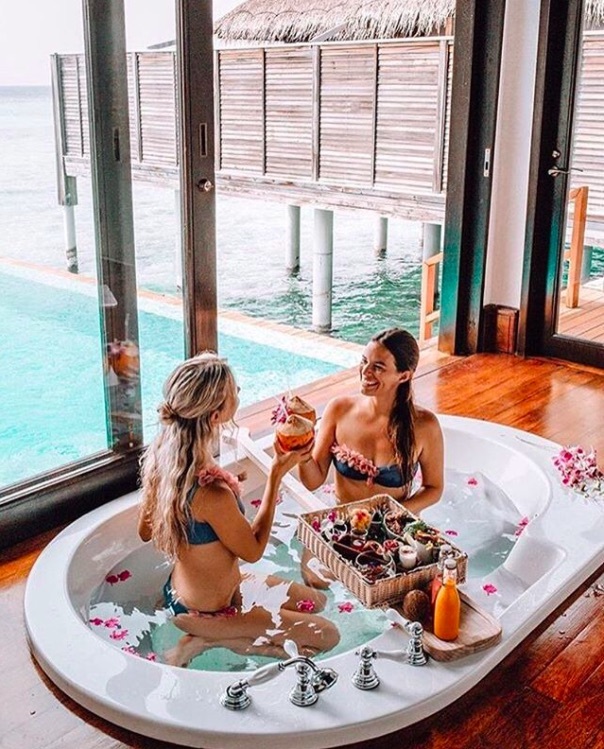 Luxury Travel Advisor is the insider’s publication for travel and tourism operatives, detailing what’s happening, in trend and upcoming in the world of hospitality. The inaugural contest saw 121,000 votes cast online, with Anantara Kihavah taking the lead! 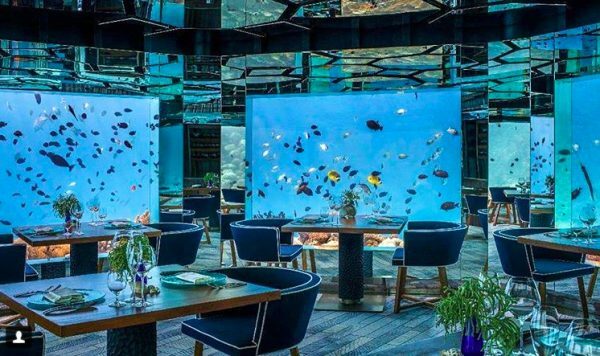 The hotel is Designed by Maldivian architects Group X Design Associates, and offers guests the world’s most stunning backdrop. 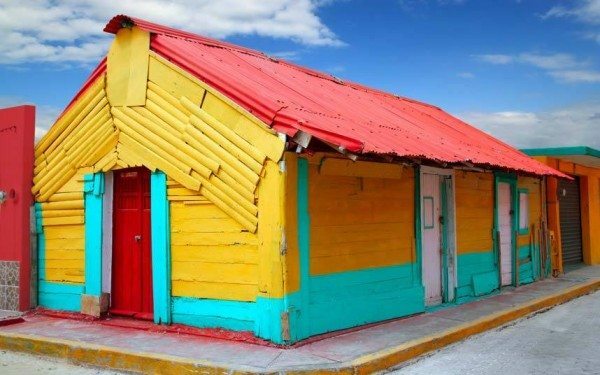 Even though luxury to the mex, it still feels natural and laid back. 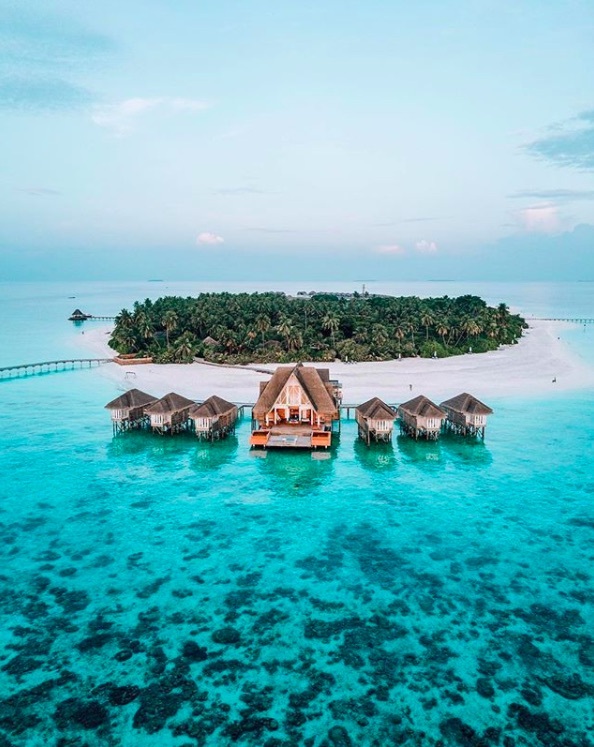 The hotel offers one in a lifetime experiences such as underwater dining, overwater stargazing, and swimming with mantas and turtles and plenty of photo opportunities! For ore info about the hotel visit this Website. The tulip season is here and they are more popular than ever! 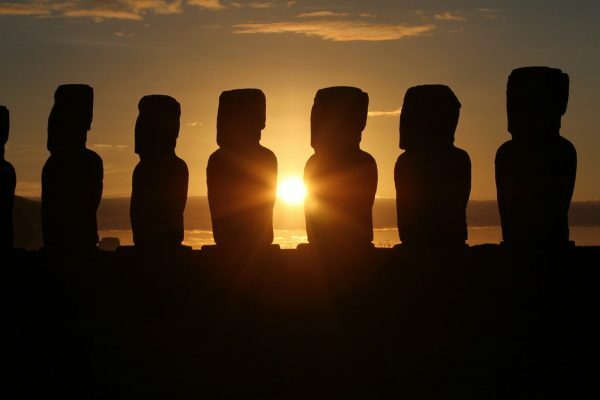 We’ve selected a few regions in the that are just out of this world.. Here are the best tulip fields in the Netherlands. 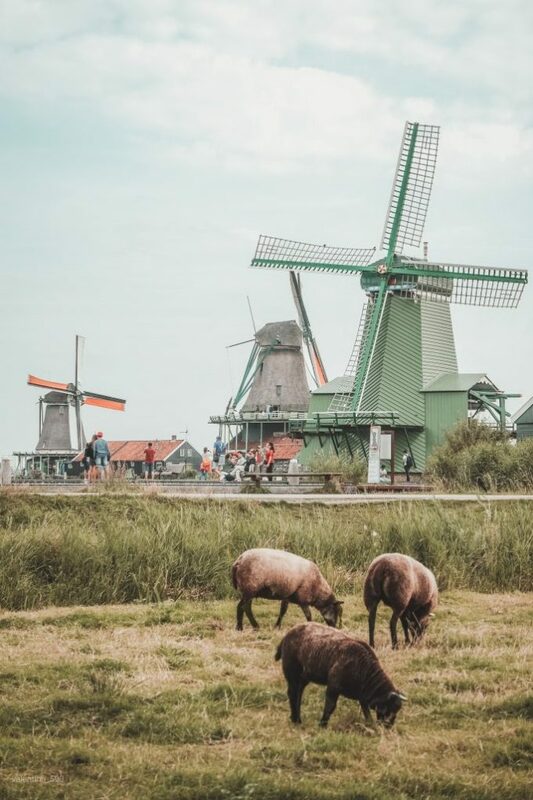 This tiny place is located in the Flevoland province and has an amazing backdrop with windmills and the sea. Car and bicycle routes have been voted one of the best in the world because of the tulip fields you are about to see here. If you’re looking for beautiful purple tulip fields and flowers, you need to visit the area of Schagerbrug. The fields here look like a Dutch painting because of the windmill that is situated here. If you come during the morning, you will have the best photo’s at sunrise. Another lesser known area to spot some of the largest and most beautiful tulip fields in the Netherlands. Goeree-Overflakkee is an island located in Zeeland, which is the south west of Holland. There are around 18 tulip fields on the island, in all different colours. 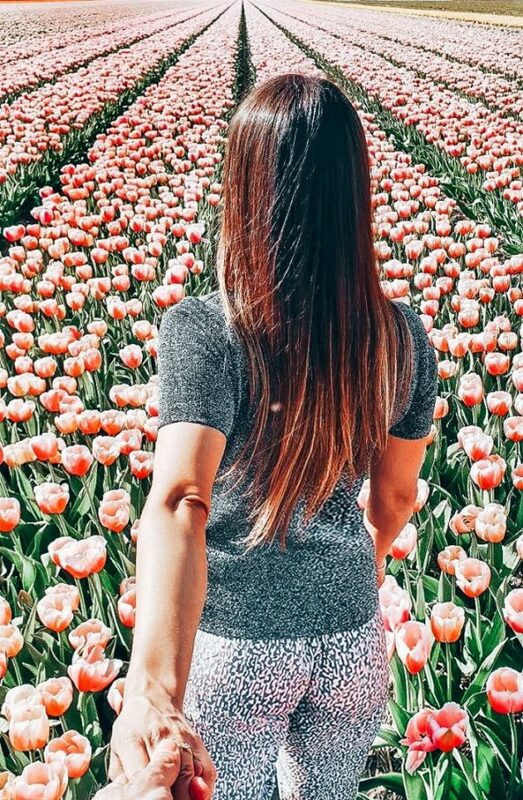 Because these tulip fields are less known, you won’t find many tourists or locals walking around, winning! From Amsterdam, it’s about 2 hours drive. One of the more popular tulip destinations. 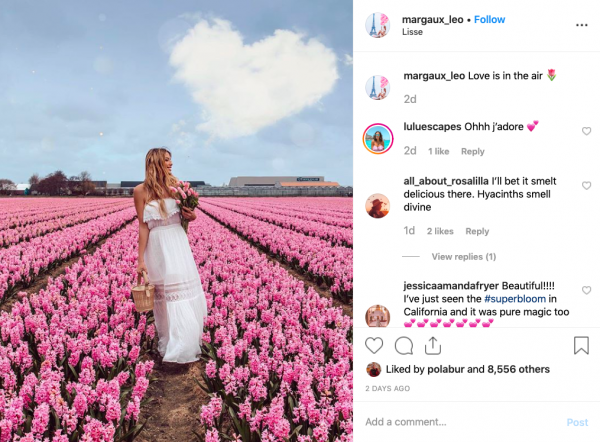 Lisse is near Amsterdam, so it explains why so many people go here. 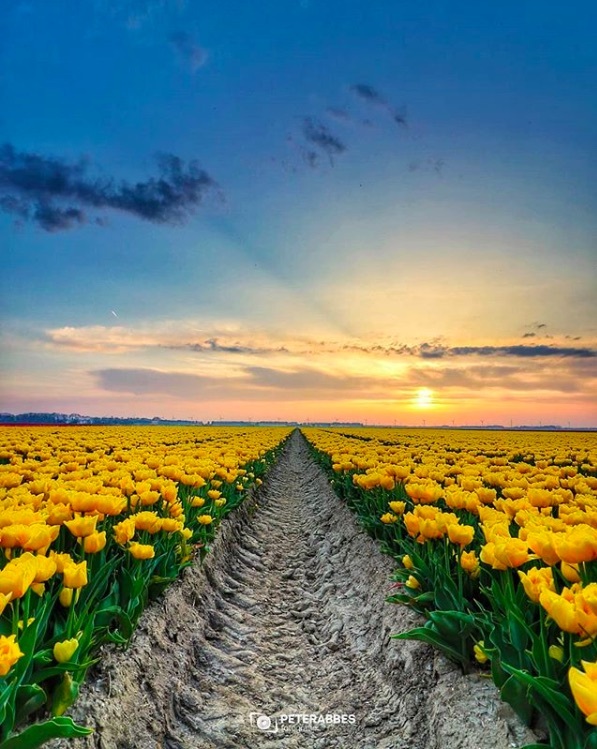 If you can, visit these tulip fields during the week, and early morning. If you go by car, you can drive through the whole area and make several stops. 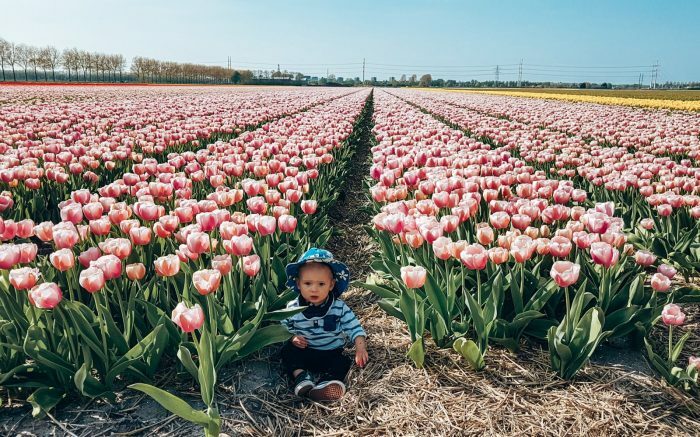 Next to the longest runway in Amsterdam Schiphol, you will find a few tulip fields. Combine this with a trip to the Polderbaan to see airplanes take off and land. 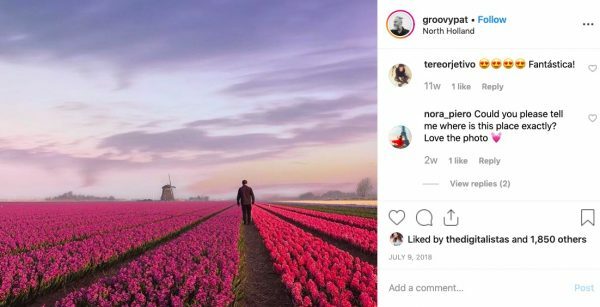 This is also the tulip field you see in the header photo of this article. We have the Van Gogh Museum, and we have the Keukenhof. It’s the one place all travelers know about. Mind you, if you visit the Keukenhof, you will share the tulip watching with thousands of tourists from all over the world. Buy tickets to the Keukenhof. 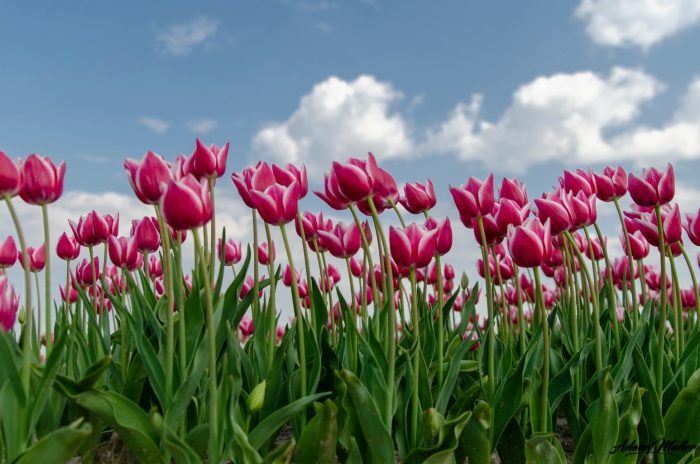 There are over 150 species of tulips with over 3,000 different varieties. Please be aware that you cannot walk into every tulip field. If you see the farmer, please ask for permission. Otherwise respect their crop and do not walk in between the flowers (only the ground/sandy parts). There are wider area’s that you can take photo’s from. This year many tulip farmers have decided to close their fields with gates because there are so many tourists ruining their tulip field. 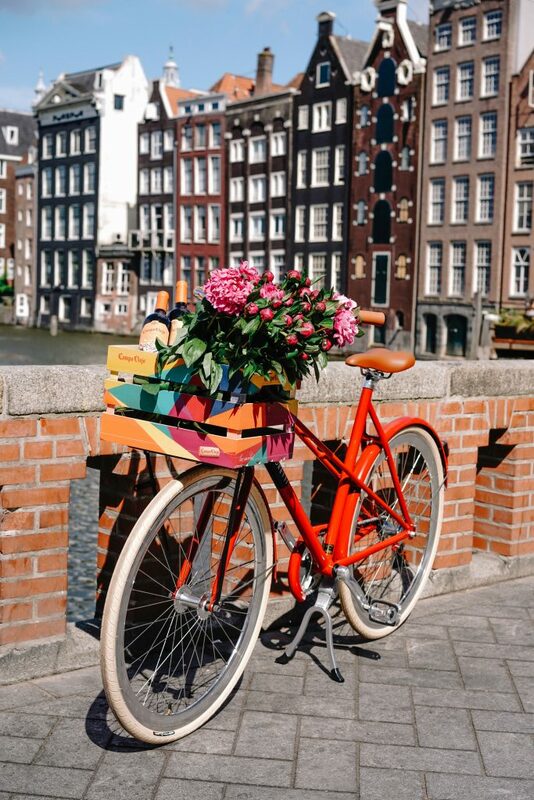 Treat yourself to some flowers at the Bloemenmarkt in Amsterdam! 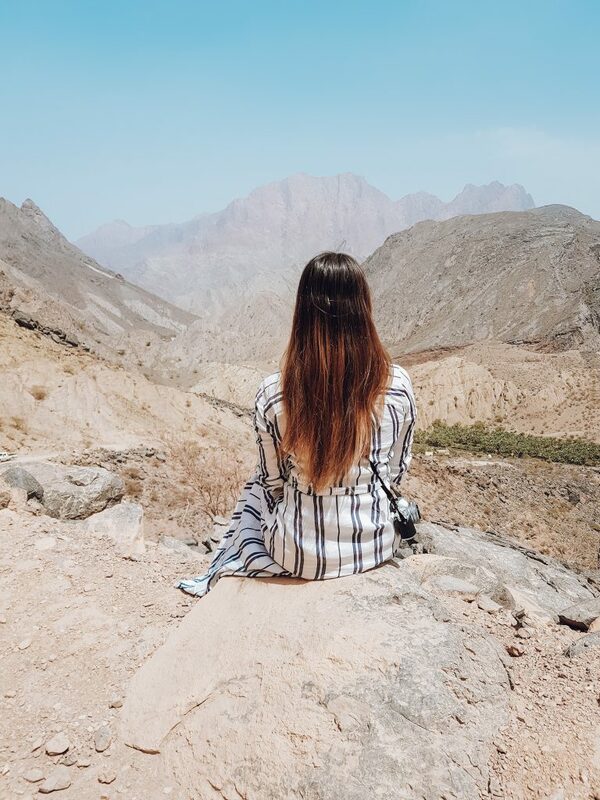 Oman was voted as one of the top destinations for 2018 and since then we knew we had to visit. 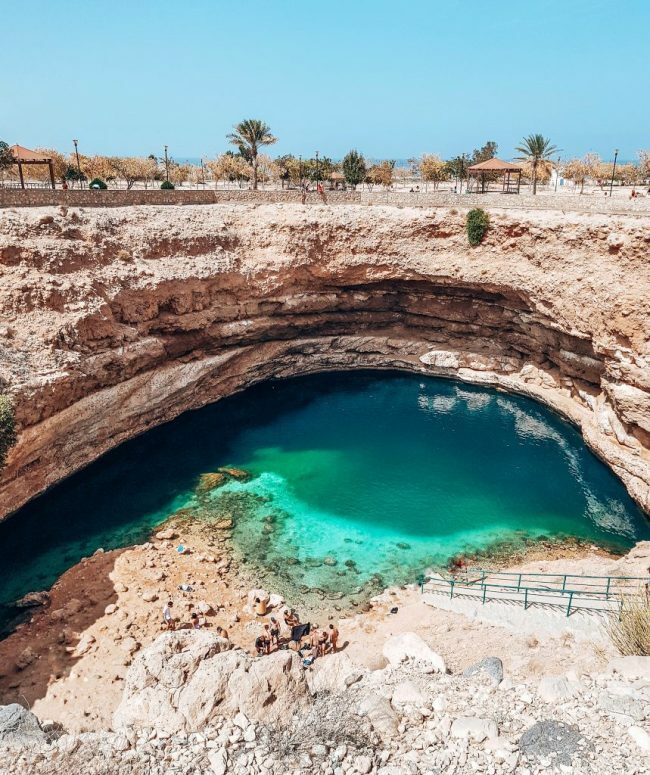 Oman is extremely divers and has many route possibilities. 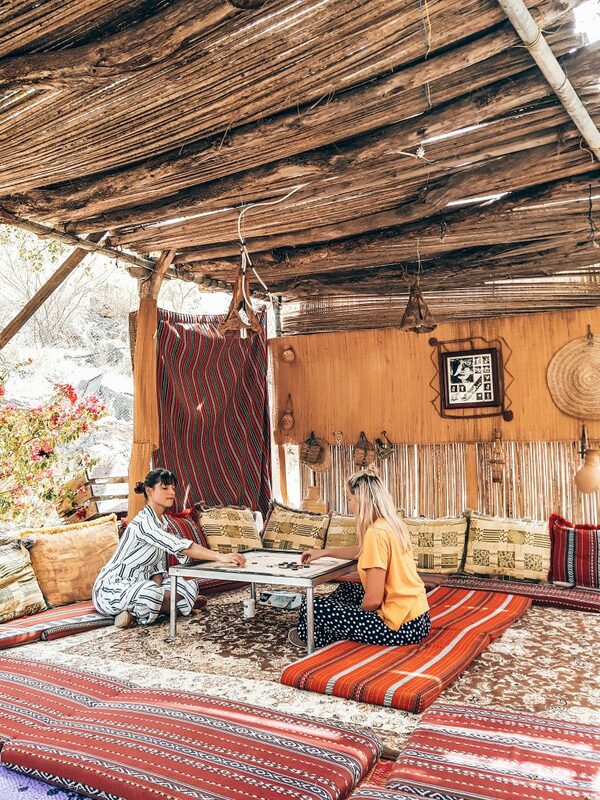 We’ve created the ultimate Oman Travel Guide for 2019 so you can get off the beaten track. 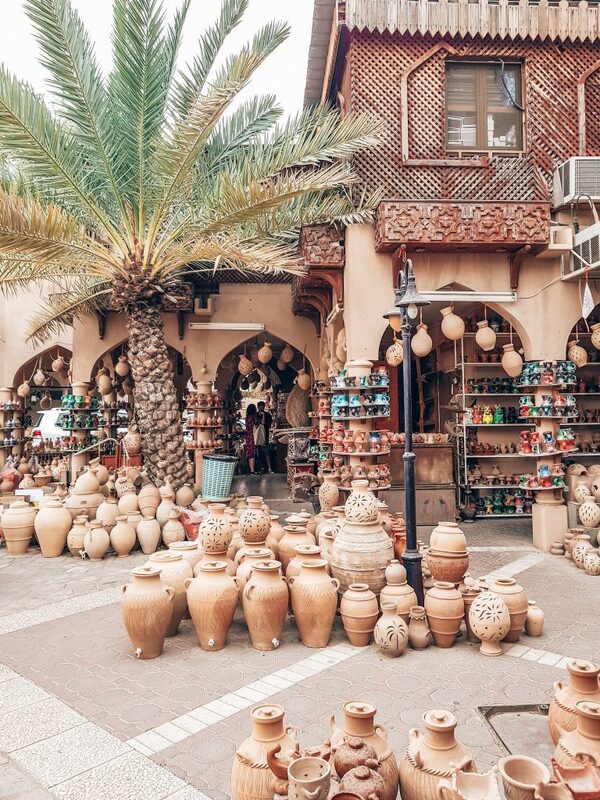 There are a few things that you need know about the Sultanate of Oman. Yes, there are still some misconceptions about this. Oman is in fact one of the safest countries is the middle east and the crime rate is low. We advise you to check your local travel advise agency, but there wasn’t a moment that I felt unsafe. The people of Oman are extremely generous and welcoming. A 10 day visa will cost you about 12 Euro, and is available online. Print it and bring it with you. Your passport needs to be valid for at least 6 months. Other visa’s are also available. Oman is warm throughout the year with the hottest season between June and August. October up to April are the most pleasant. 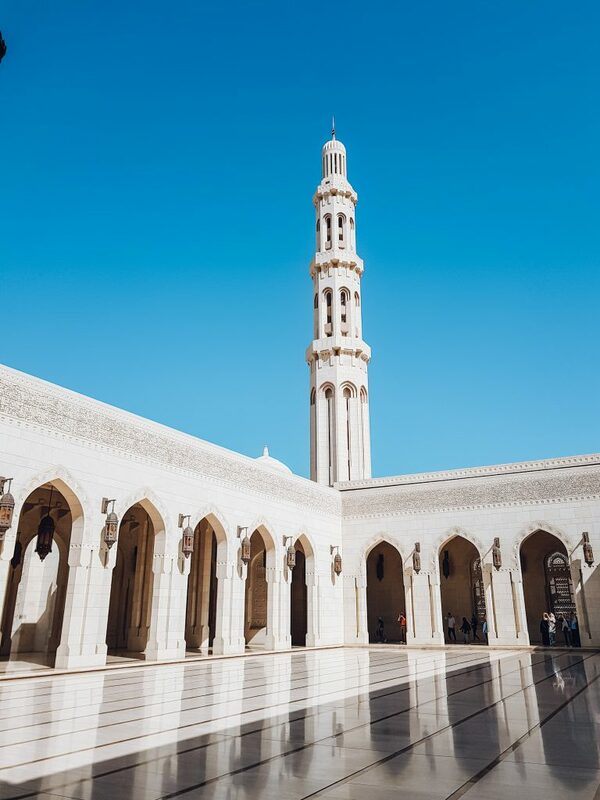 Oman is an islamic country, therefore it’s wise to bring a kaftan and head scarf when visiting the Grand Mosque and some public area’s. In most hotels and Wadi’s, you can wear summer clothes, but bikini’s are not always accepted everywhere. Bring a shirt and long trousers just in case. For this reason is also not the most affordable one, and you can compare prices with western Europe. Because Oman is so widely spread open, that the distances between the highlights are far. Sometimes you need to drive for 2 hours to get somewhere. Public transport and taxi’s are used in the capital. The capital of Oman is Muscat and the perfect place to start your trip from. 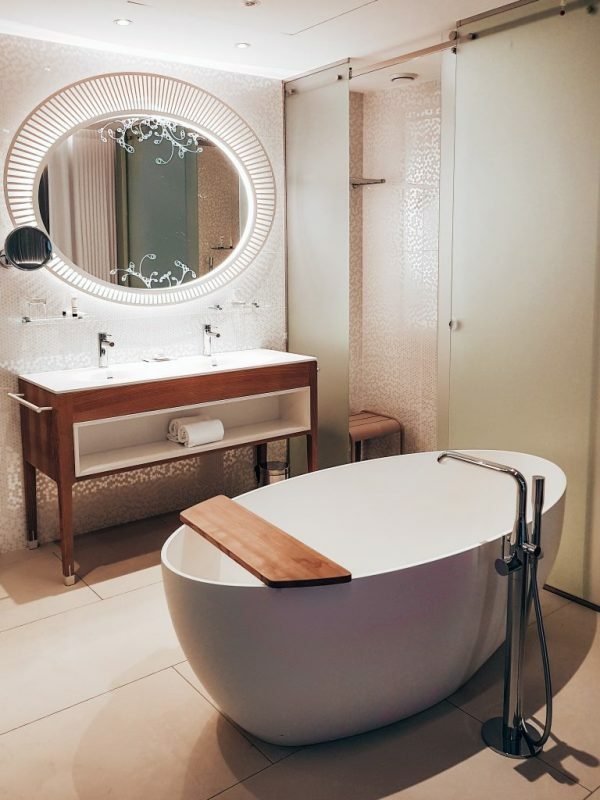 You can choose between different hotels, both luxury and the more standard ones. 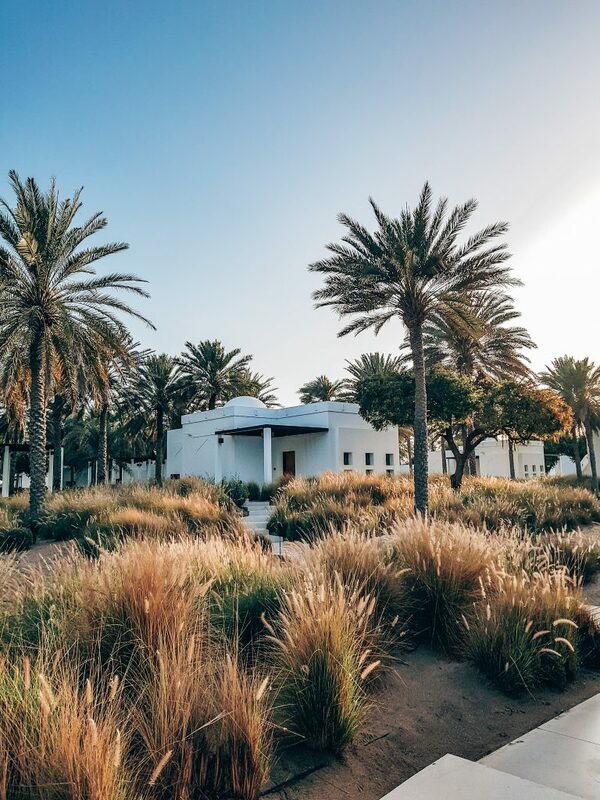 We stayed in the Chedi Muscat, which is top range, but well worth it if you want to go all out for your first night. Hotel rooms vary between 300 and 1000 euro per night. From Muscat you’ll start your trip though Oman. Along the way we tip you the best accommodations with links and details. 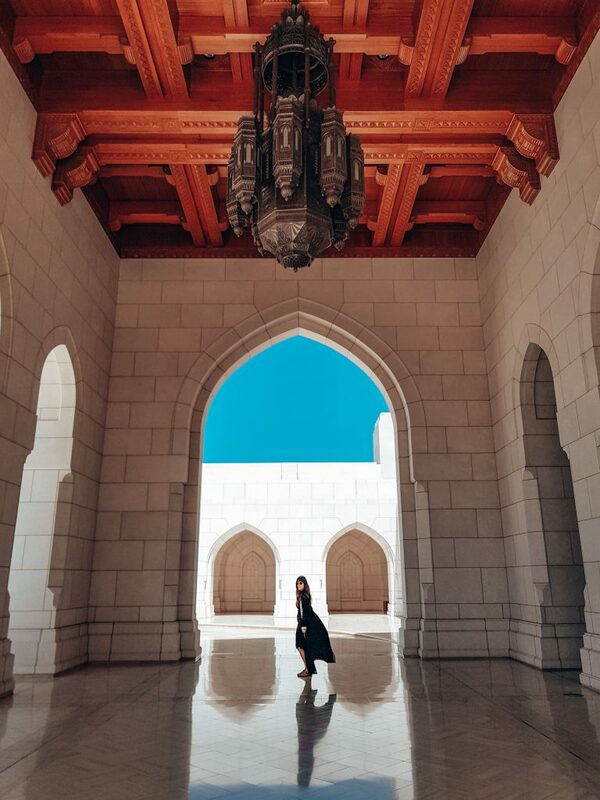 Muscat is full of beautiful architecture and culture. Don’t miss the Grand Mosque which is very impressive. TIP: dress accordingly; Pants or an abaya that cover all body parts. They do have traditional clothing for rent before you enter, and we advise you to bring your own head scarf. The Grand Mosque is home to the second largest carpet in the world (until Abu Dhabi’s Grand Mosque stole that title). It took 600 women, 4 years to wave! The Mosque can hold up to 20.000 people praying, and there are tours available. We prefer just to walk around and discover the many photogenic corners of the all white Mosque. Prayers are held 5 times a day, which makes the experience even more special. Visit the Royal Opera House for a quick look around and take a look at their impressive instrument collection. If you can, visit the Al Alam Palace of the Sultan. It’s a modern and colourful building, overlooking the waters of Oman. If you like to buy a souvenir you can make a stop at the Souq van Mutrah here you can buy spices, jewellery and clothes. This market is a bit touristic, but nevertheless nice to walk around. From Muscat you can drive towards the mountains of Hajar. Stop for lunch at the Muscat Hills Resort, which is a wonderful beach club/boutique hotel with an Ibiza kinda vibe. They offer a Mediterranean menu, overlooking the private bay of Al Jissah . If you can, stay the night in one of their beach houses with outdoor showers! You can decide to relax at the beach club a little bit longer (bikini’s allowed), or head into the mountains before evening falls. Anyhow, there is so much more waiting for you along the way.. 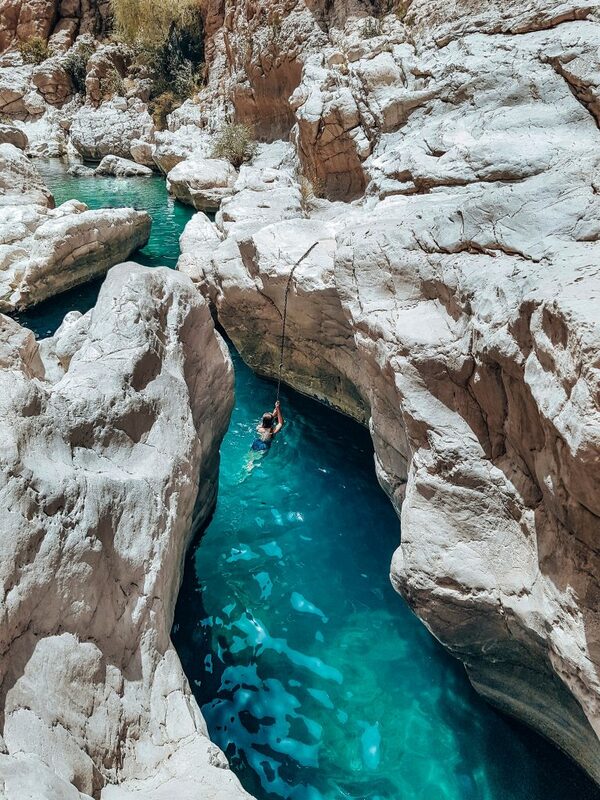 Nature in Oman is not to be compared to anything else. 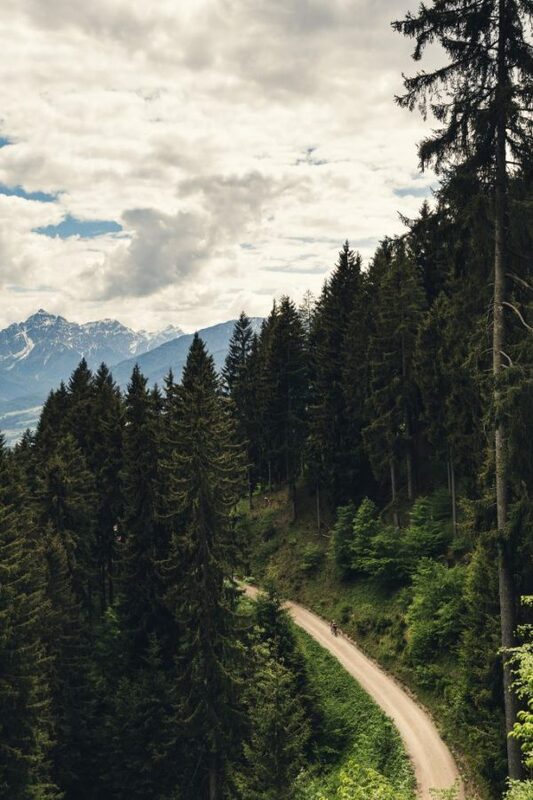 Driving through the mountains is something special. You see the landscape changing as you go up. Stop at several viewing points and local eateries like Bimah Guesthouse where you can enjoy a local Omani style buffet. 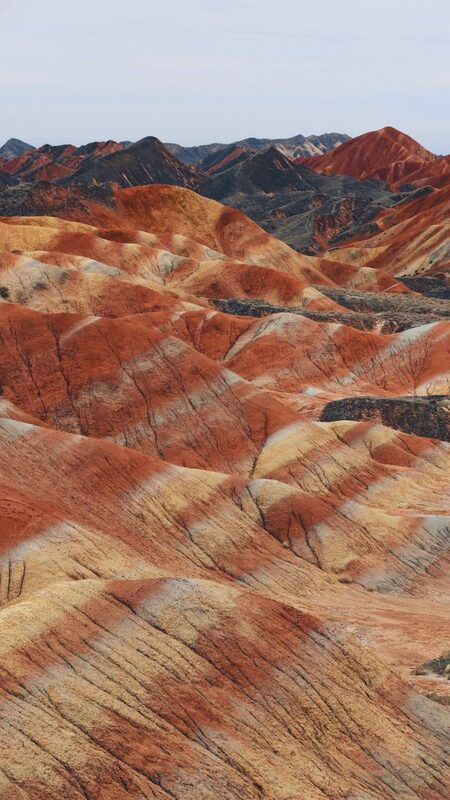 TIP: bring some travel sickness tablets, the hairpins in the mountains can make you feel a bit nauseous. 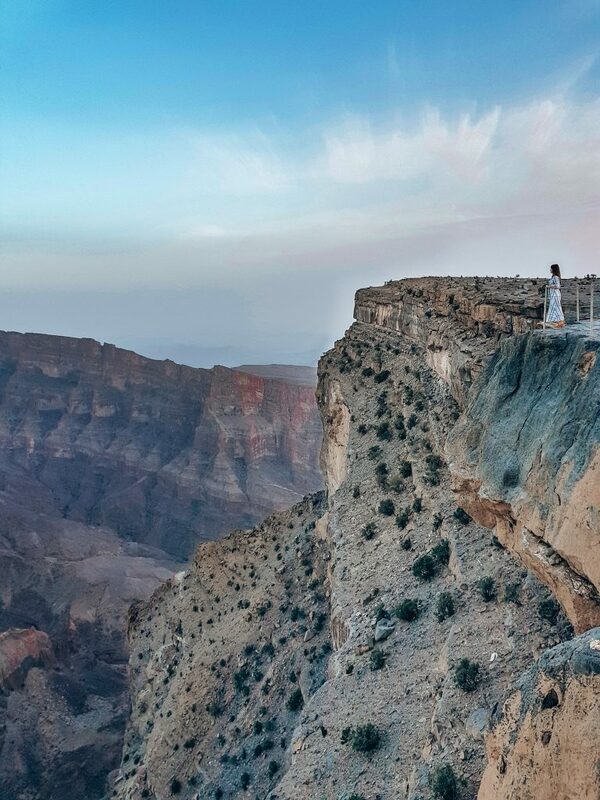 One of the highlights is Jebel Shams, the grand canyon of Oman. The view is stunning! 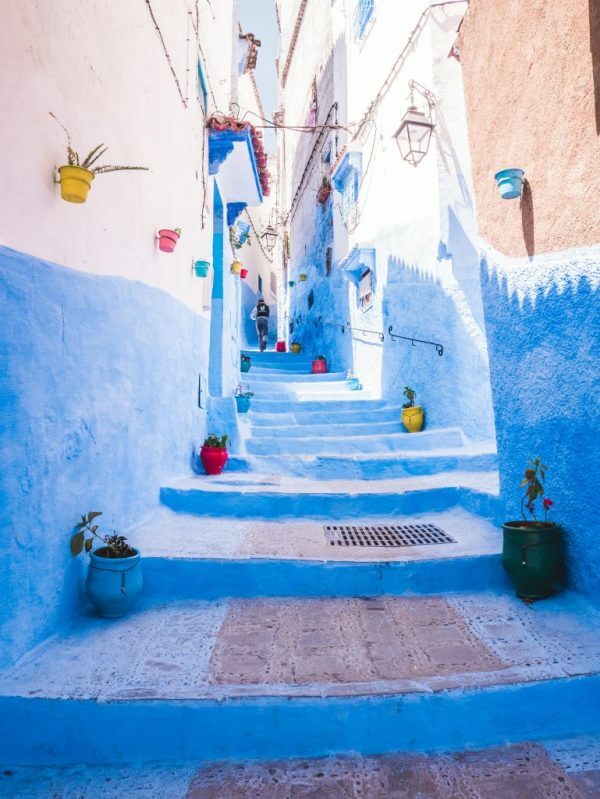 To get here, you drive past local villages like Balad Sayt and Al Hamra. If you like to hike, this is the place for you. 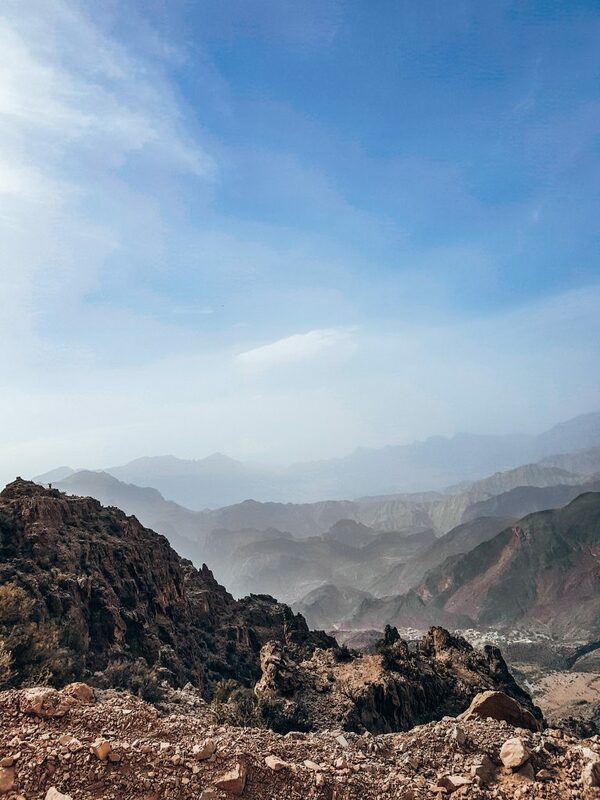 There are short or longer hikes available (W4 and W6 pathways) that will take you past waterfalls and local villages such as the ancient village of Al Khateem. 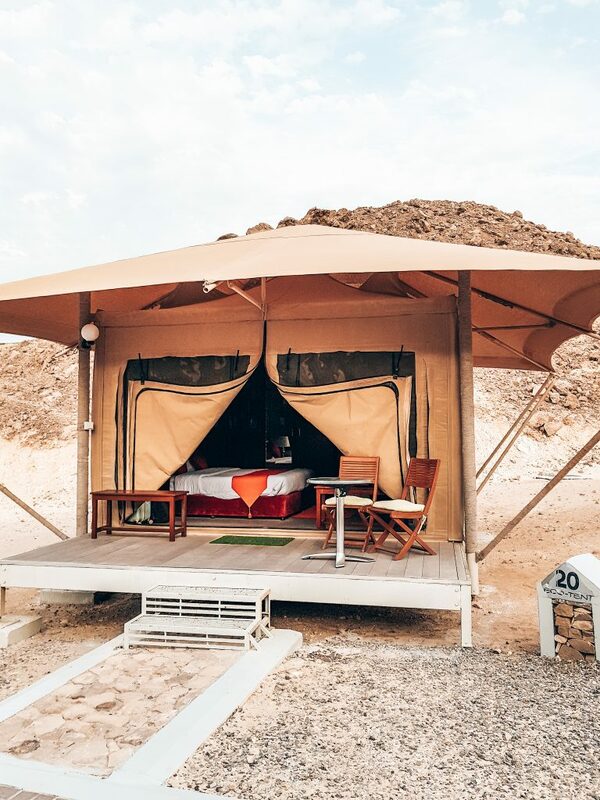 We slept at mountain eco camp Sama Heights, located in Jebel Shams.This fully-fledged eco resort is the first of its kind in the Sultanate. 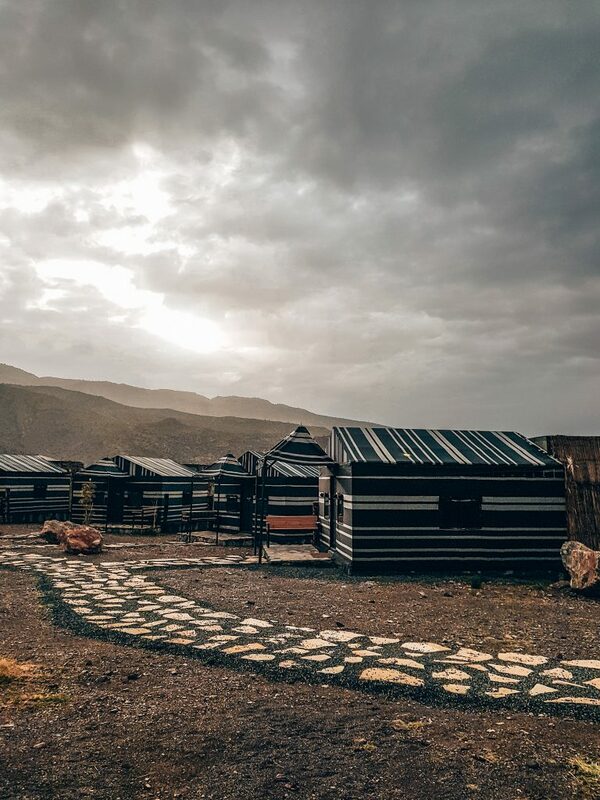 They offer mountain view private villas made from Omani stone and recycled materials and you can also sleep in Bedouin style tents. When you wake up, the sunrise behind the mountains make it worth your while. We also enjoyed the dinner buffet, with lot’s of vegetarian options! Nizwa one of Oman’s ancient cities and used to be Oman’s capital city. It remains a popular stop for shopping. You can visit the traditional goat market where they auction livestock. It may be a bit daunting at first, but to be fair, I prefer the traditional way compared to the livestock factories back home. 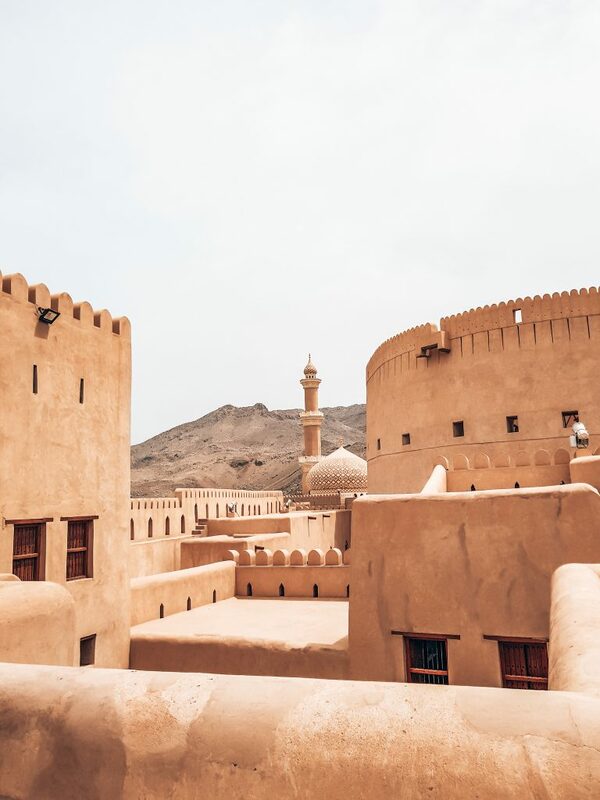 Nizwa is also known for the ancient fort, that overlooks the old city. 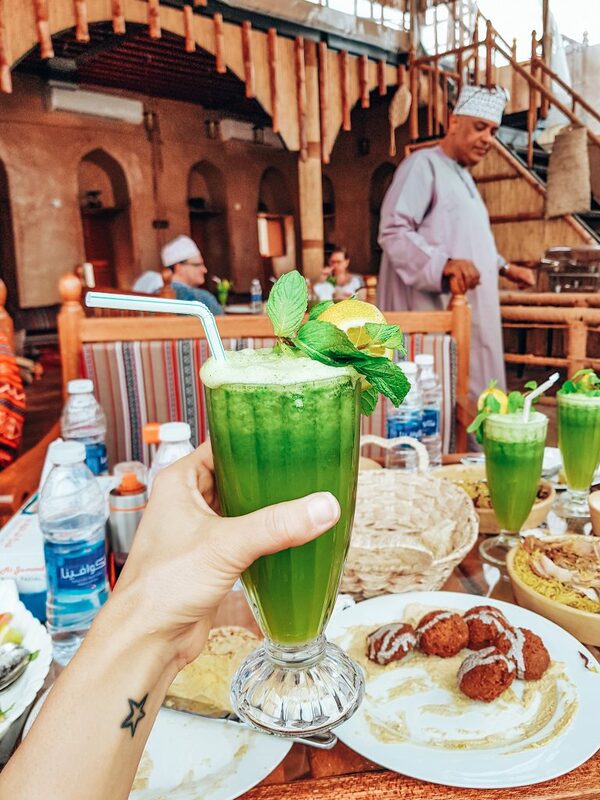 If you have time, grab lunch at Al Aqr Traditional Restaurant and order a mint/lime juice to cool off on their rooftop. They serve delicious homemade humus and baba ganoush, plus other traditional Omani dishes. 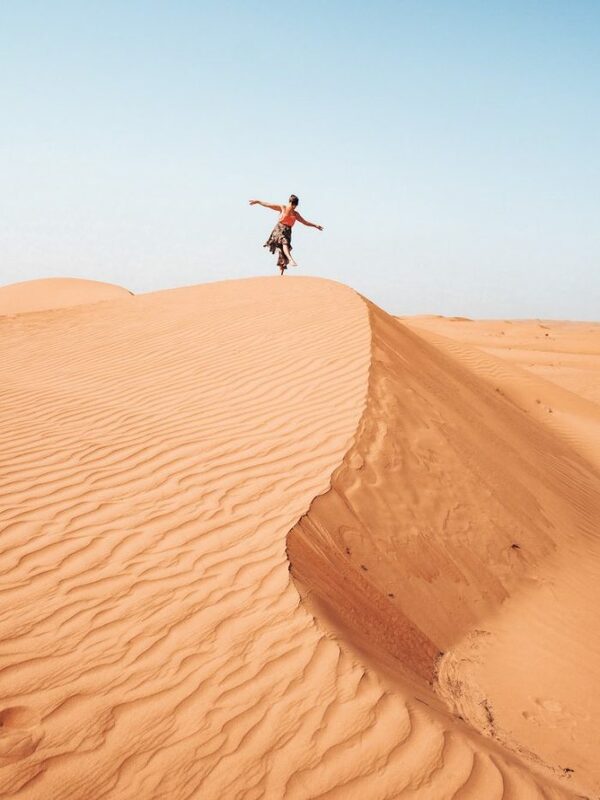 After a stroll around Nizwa, you drive towards the Omani desert named Wahabi Sands. 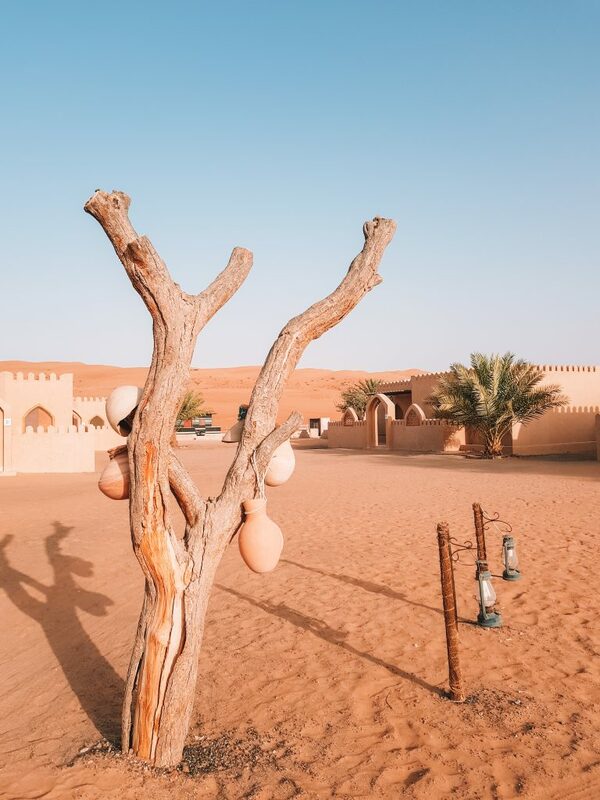 As you drive towards the red sand, turn up the Arabian radio to get the real desert vibe! 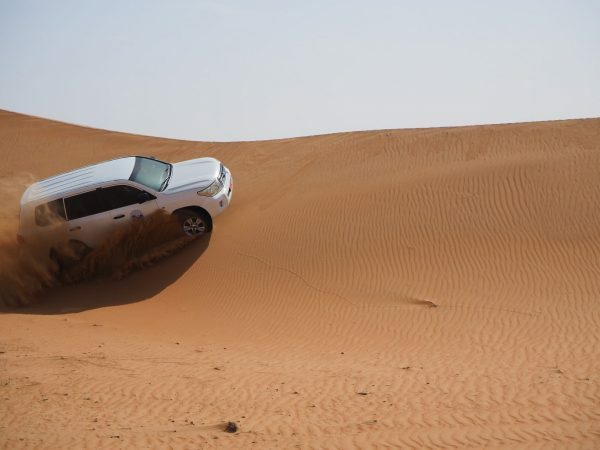 If your tour guide drives a good 4×4 car, he will drift across the sand, and slide sidewards off the sand dunes. Pretty awesome! 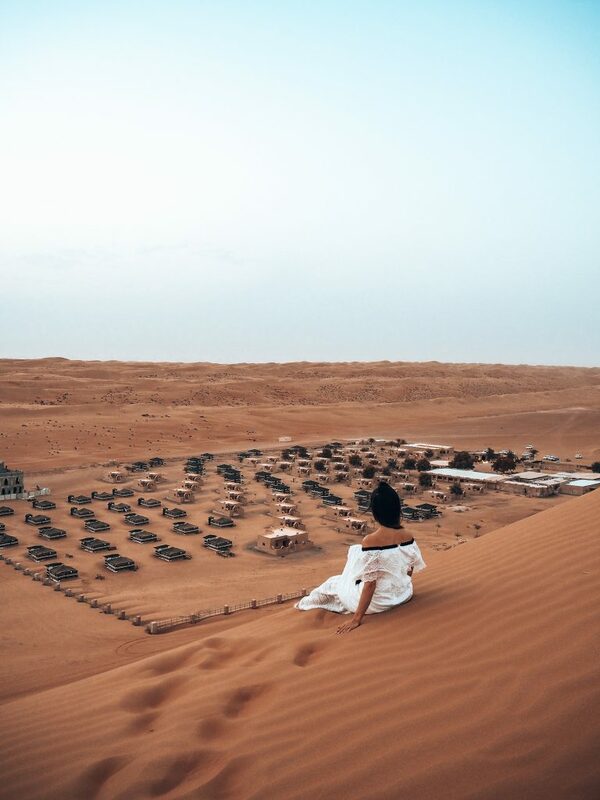 In the desert are several camps where you can spend the night. 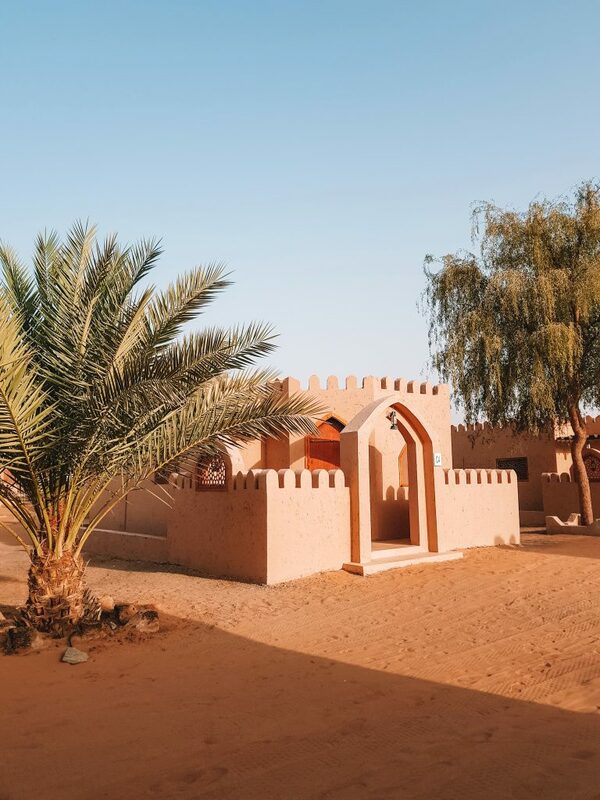 We stayed at the Arabian Oryx Camp, with cute stone houses, and a perfect location. From here you can book several activities such as sand boarding, quad or camel riding, and safari’s though the desert. We advise you to stay for one night. How cute is my room! 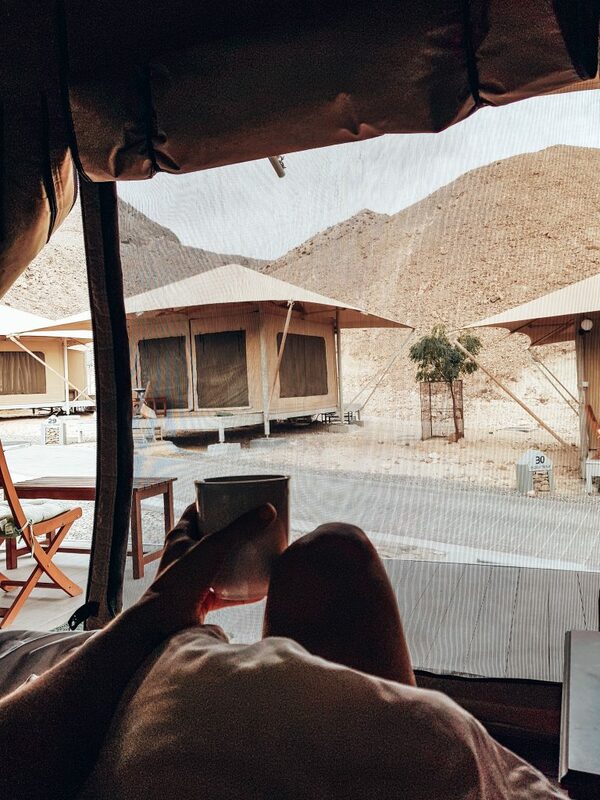 Take your time and enjoy the morning sun in the desert before heading towards the next adventure. 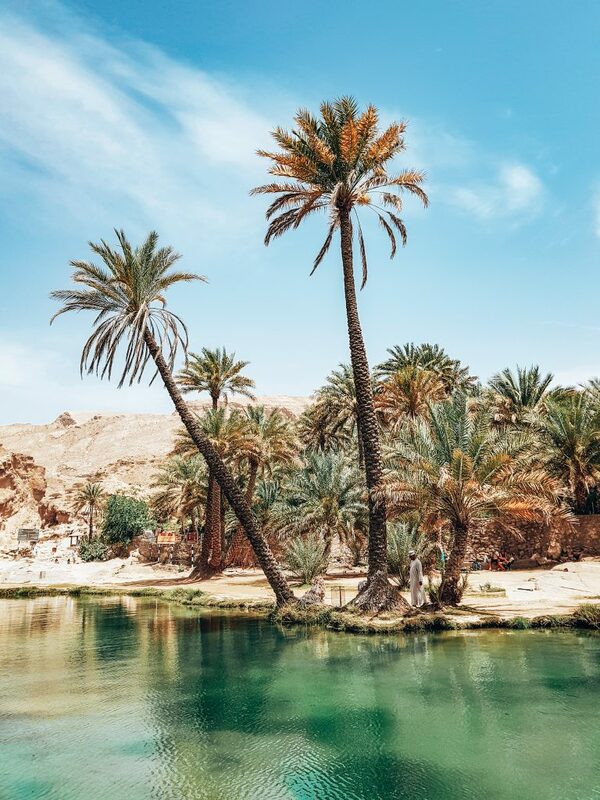 Wadi Bani Khalid is not from the desert and the perfect spot to cool off when it’s hot. Mind you, during the weekend a lot of locals will also come here, so it can get quite busy. If you want to swim in this valley, you need to dress accordingly, No bikini’s allowed! You can also have lunch here, but reserve a table as soon as you arrive during lunchtime. This way you’ll get the best view and saves you waiting for a table. From the restaurant you can walk all the way past the water stream and you can also find the ropes in the water if you feel like playing around. 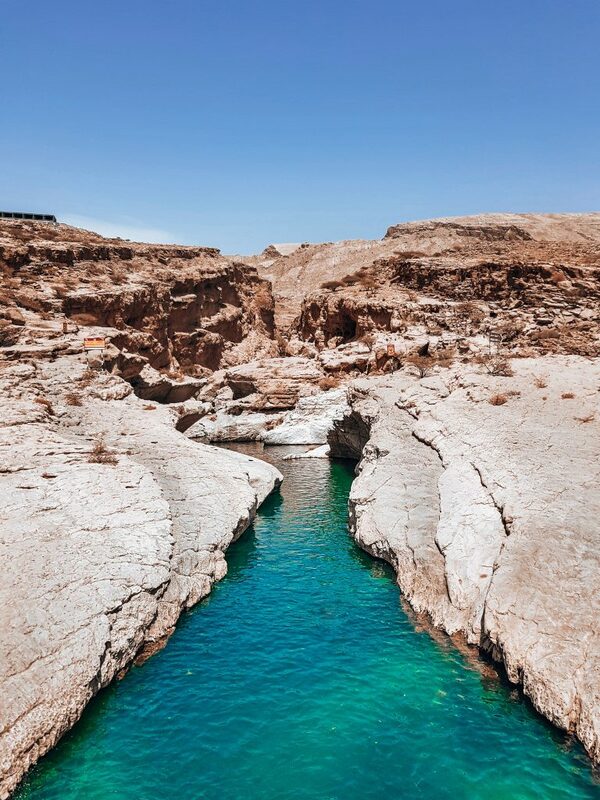 Oman’s lush northern coast lies between the sea and inland mountains. From Wadi Bani Khalid, you need to drive for about 2 to 3 hours until you reach this special place. If you have never seen sea turtles before, it’s a must do! This turtle reserve is located next to the … coast where many sea turtles lay their eggs during a certain period. Ras Al Jinz Turtle Reserve protects the turtles by organising controlled tourists visits that are done with professional guides. If you book the night here you have 2 options to see the turtles. One in the evening around 9pm, and one at 5am, when the sun comes up. I opted for the evening watch and it didn’t disappoint! We saw at least 8 turtles coming out of the water, returning, and we saw one female laying her eggs! Turtles are deaf, so they don’t hear you, but they can be sensitive to light. Therefore, the guide provides a special torch so you can watch the turtle without interfering them. It was stunning! Not a bad way to wake up! We advise you to book one of the luxury tents to make your experience even better. 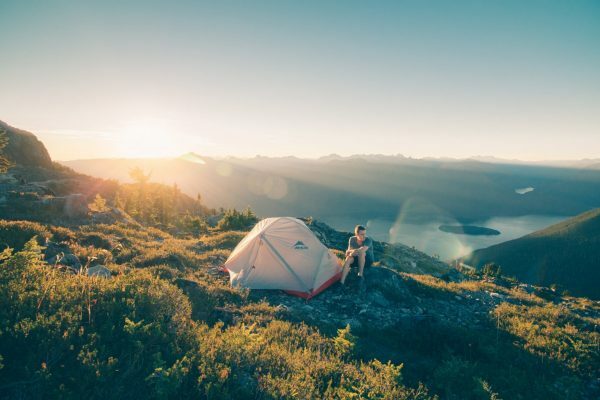 Tents are equipped with a bathroom, airconditioning, TV and a comfortable bed. Book your visit here. On this last day you’ll slowly make your way back to Muscat. There is no time for sleeping in the car, because the landscape you are about to see is out of this world, really. You can stop at various locations such as coastal town Sur, where they still make the traditional wooden ships that Oman used up until the early 70’s. 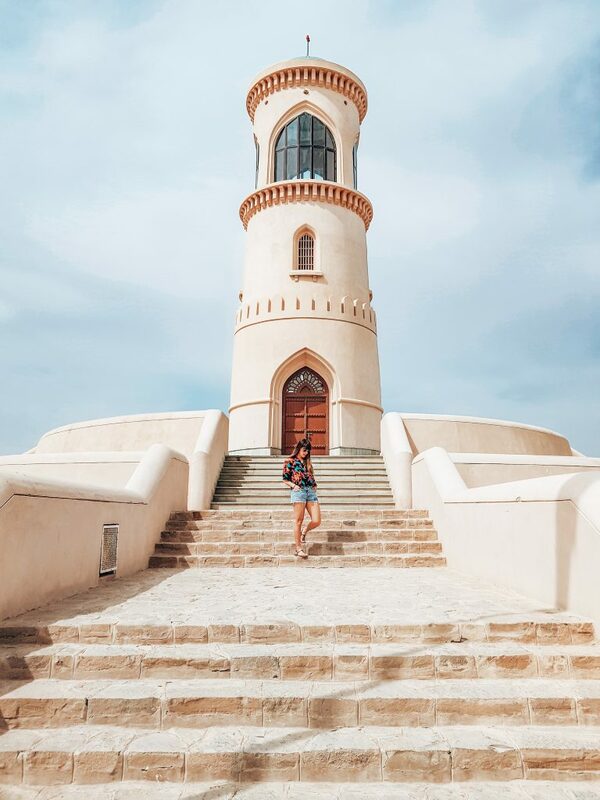 Here you can also find the lighthouse overlooking Sur and the water which is also full of sea turtles! 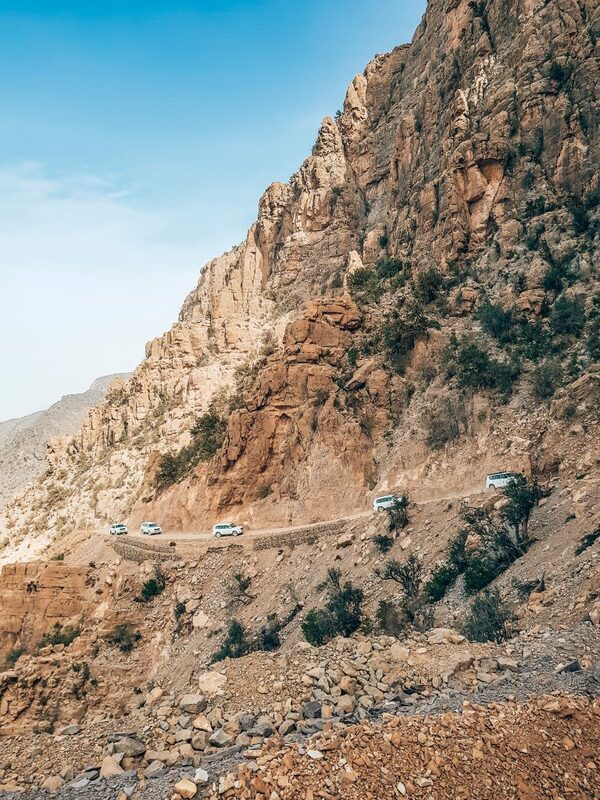 Verdict: Oman is safe, welcoming and for those who like adventure. Oman even has beaches, but it’s not the Mediterranean of course. 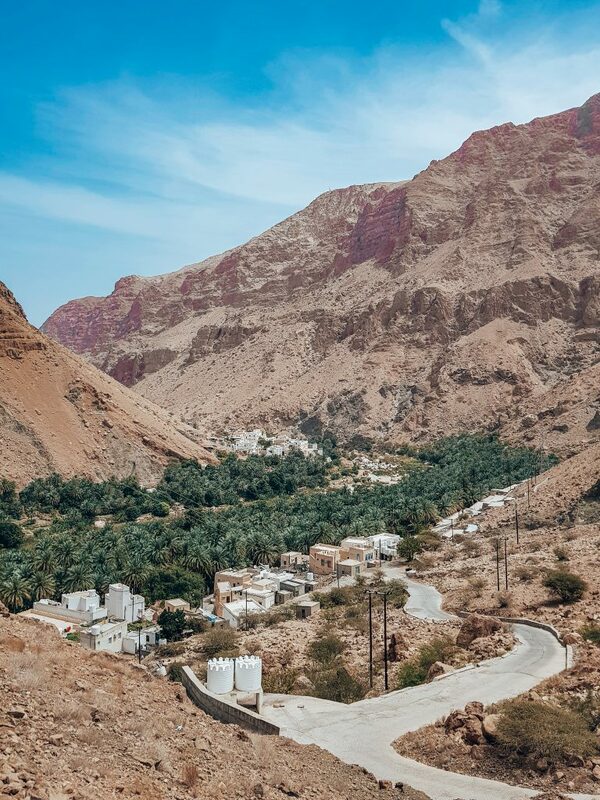 If you decide to visit Oman, it’s more likely to be an active holiday, with long (stunning) car rides, great food, interesting culture and nature you cannot compare to anything else. If you want to bring your kids I say, do it, but from the age of 5 years or older. 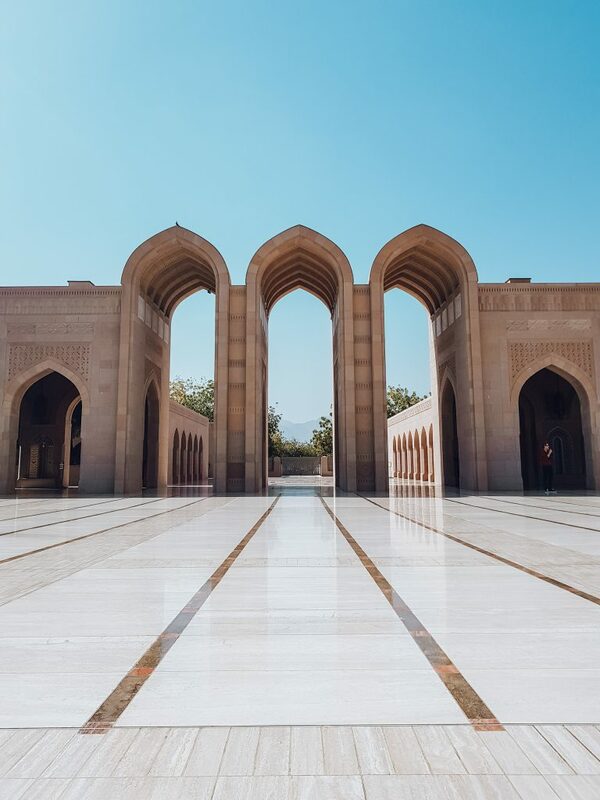 In one sentence; Oman should be on your bucketlist! 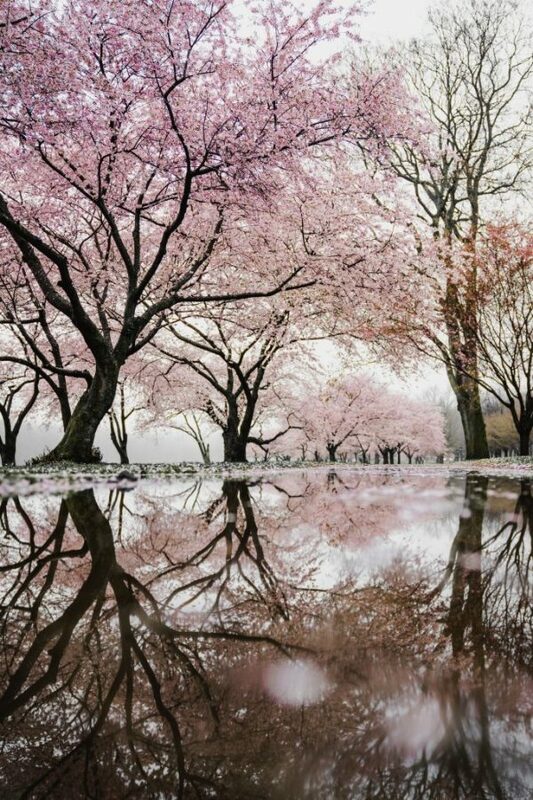 Walking around Paris now, you’ll find lots of beautiful cherry blossoms, filling the once empty branches and giving them a lovely pink makeover. Despite the currently cold and rainy weather still, there had been a few weeks of sun and warmth, fully convincing us that Winter has come and gone. 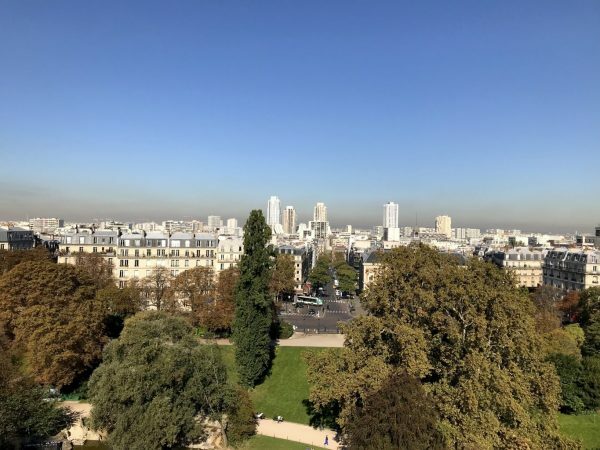 Nonetheless, this week, it will officially be Spring and here is a list of the most beautiful parks and gardens in Paris for you to welcome it with open arms! 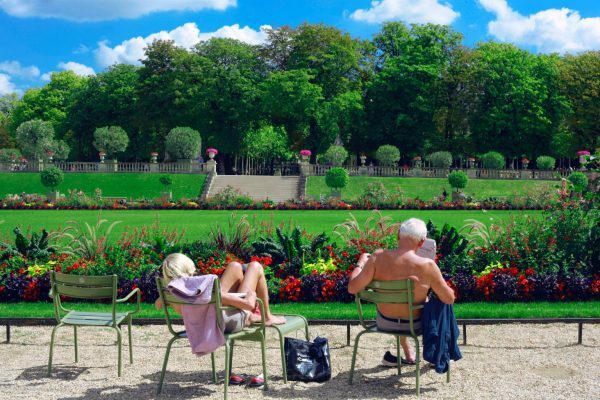 Located in the 6th arrondissement, Jardin du Luxembourg no doubt is the most beautiful garden in Paris. Surrounded by trees and beautiful plants, you will find the famous Fontaine Médicis, a 17th century fountain, as well as a miniature Statute of Liberty in the park. You cannot miss the beautiful Luxembourg Palace, at the northern end of the jardin. Pay a visit and learn about the interesting history surrounding this wonderful open space. This is probably the largest leisure spot in Paris, stretching itself across the 16th arrondissement. Within Bois de Boulogne, you’ll find different sections, including Parc de Bagatelle, Jardin des Serres d’Auteuil (which has the most beautiful greenhouses) and Jardin d’Acclimatation. It will literally take you more than a day to enjoy the entire space, which was also formally a hunting ground for the French Kings. 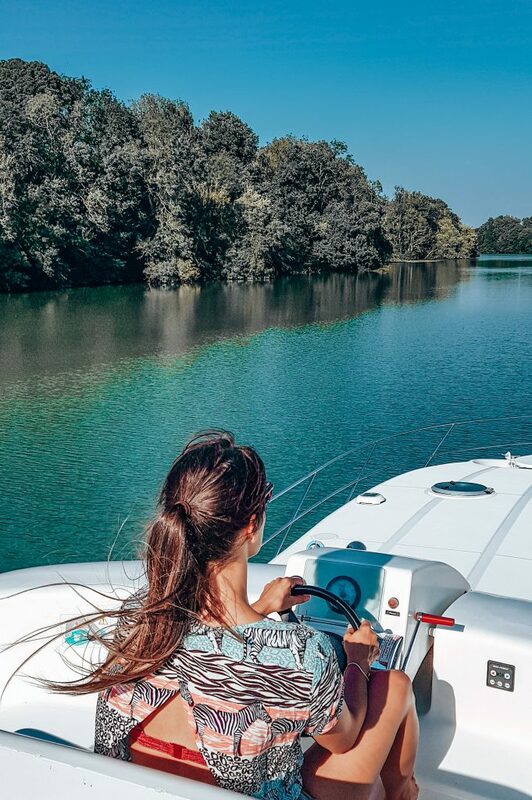 Nowadays, you can find a Michelin star restaurant on a tiny island in the middle of the lake, a museum, children’s playgrounds, as well as a theatre and boat and bicycle hires, just to name a few! This beautiful place has 11 gardens, a zoo and several galleries. Jardin des Plantes is not your ordinary botanical garden. 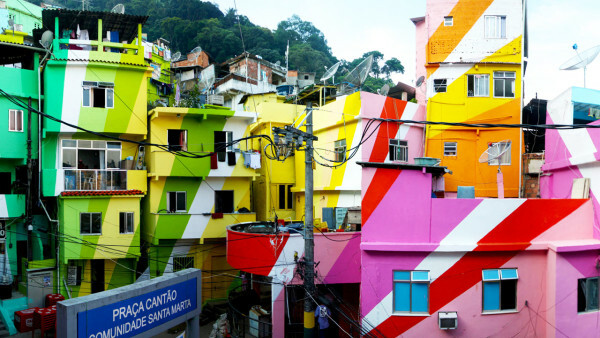 Having just hosted its first ever light festival last Christmas period, you can expect more amazing events to come. Whilst some of its exhibitions charge a small amount of entrance fee, the garden and its libraries are free all year round. Under 26 EU citizens can also enjoy the rest of the paying areas for free! This picturesque park is again, one of the biggest green space in Paris, sat nicely in the 19th arrondissement. Grab yourself a picnic blanket and some good walking shoes. You can find a beautiful waterfall inside the cave. Walk over a long suspended bridge to reach the top of the mountain, where you will come to a nice viewpoint overlooking the city. Although artificial, the lake is a nice area to chill and rest after those hikes. This park is elegantly situated in the 8th arrondissement, with beautiful gardens, a clear pond, many sculptures and a gorgeous Renaissance archway. The park is in the heart of the more upscale neighbourhood, where you will find the Asian Art Museum, Musée Cernuschi. Top tip: walk along Allée de la Comtesse de Ségur towards the direction of Place du Général Brocard, you will see the Arc de Triomphe from there, framed nicely by the black and golden gate. If you visit one or more of these parks, let us know! We always love seeing you visiting places on our recommendation. Paaseiland Amsterdam | A beachy spot opening this April! Summer it’s on it’s way, and with that comes a new hotspot that everyone is waiting for. Paaseiland Amsterdam is opening this April is is set to become THE place to be when the sun shines. Paaseiland Amsterdam is calling themselves a beach resort so they needed a location near the water. They found it at Het Stenen Hoofd, which is located near Central Station and overlooks the IJ. This location is often used for food festivals, open air cinema’s, and was originally build for the Holland-America cruise liner back in the day. A few days ago, a few lucky people could have a few taste of the menu at Skatecafé in Amsterdam. On the menu? They served Laska curry soup, fish burgers and a vegan crispy tempeh burger. For dessert they finished the evening with a delicious coconut-guava cake. One thing that stands out, is that they will be serving non-alcoholic drinks. We think it has something to do with the permit, but we’ll keep you posted on that. Is Paaseiland going to be the new Pllek? What we know now, is that Paaseiland is going to have an intimate terrace with hammocks where you can enjoy the pacific menu. 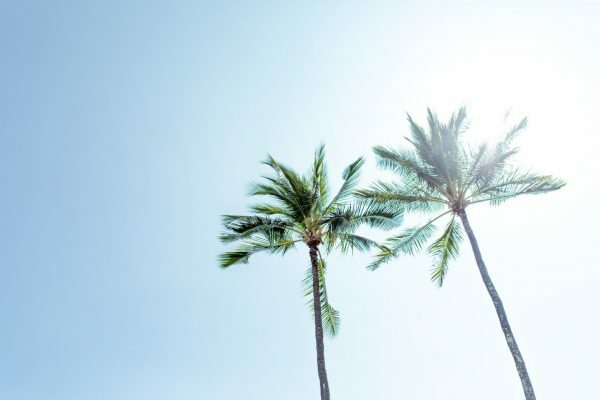 Relax on the grass, with palmtrees and chillout music. 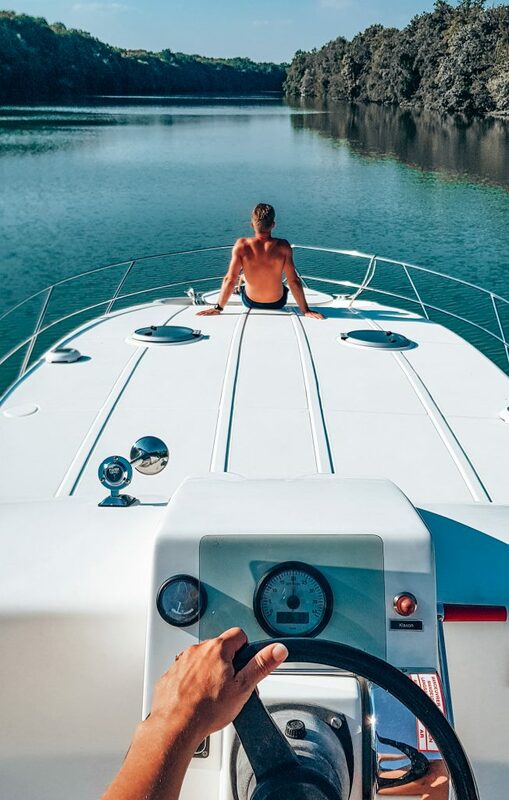 One thing is for certain, the view is going to be worth your while. 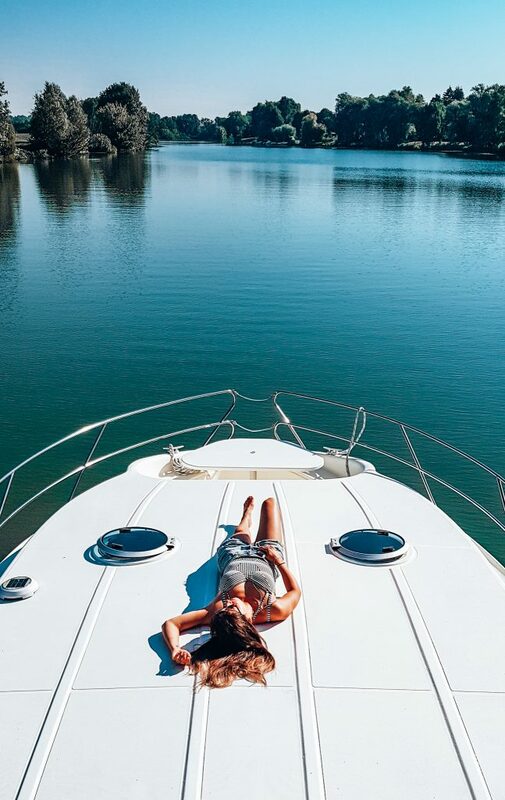 Passing boats and long hours of sunshine with beachy cocktails. See you at Paaseiland Amsterdam when the sun’s out! 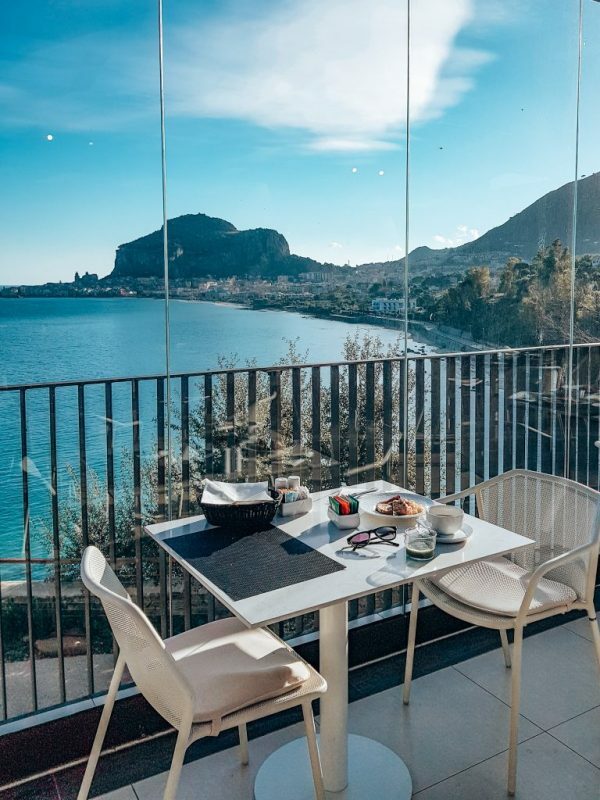 Club Med Cefalù on Sicily re-opened and it’s amazing! If you would have asked me a few years ago, I would never have gone for an all inclusive resort. I love adventure, the unknown, and “All Inclusive” was only something families would book. 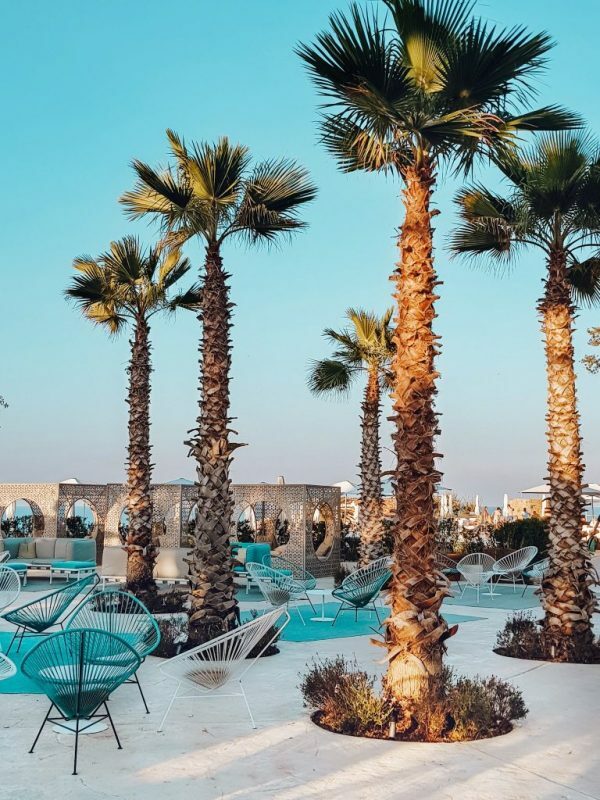 Well, after experiencing Club Med Palmiye 2 years ago as a babymoon (I was 23 weeks pregnant at the time), I completely changed my opinion. You can imagine my joy, when I was invited to experience the newly opened 5* Club Med Cafelù resort in Sicily. 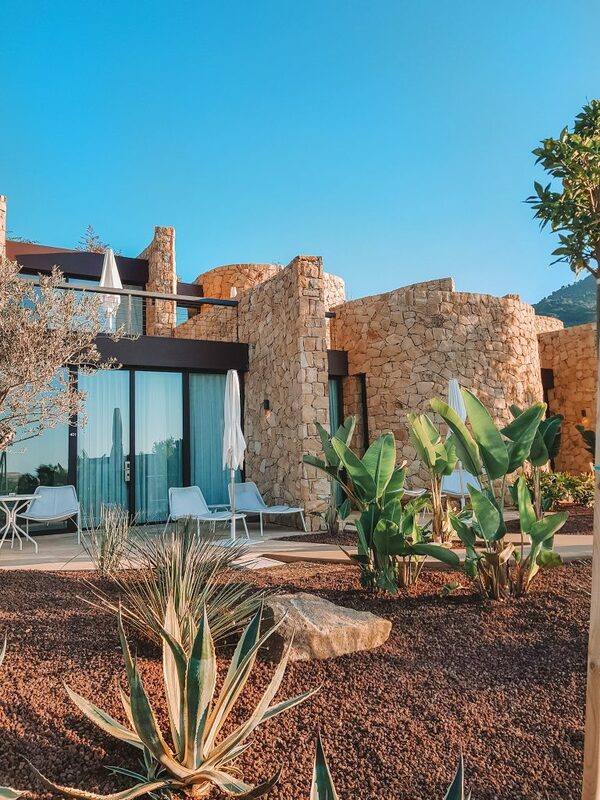 Club Med Cefalù is one of Club Med’s oldest resorts, that they have completely transformed and constructed. 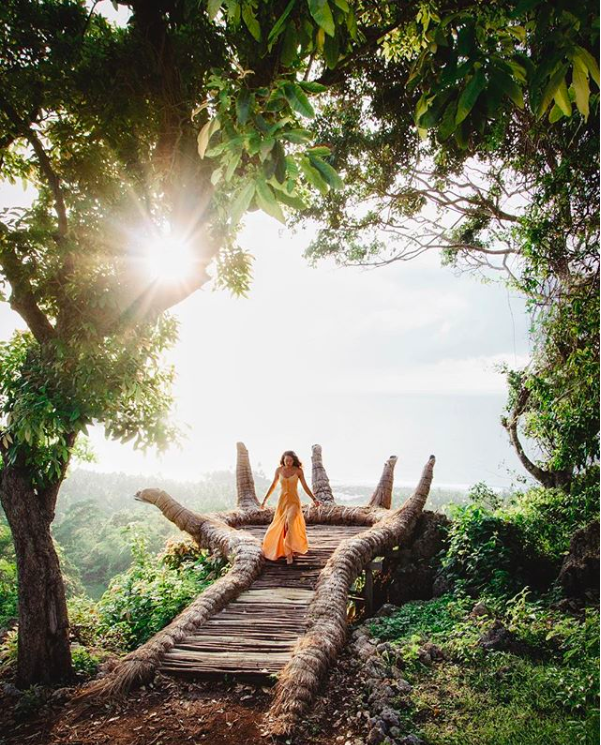 Now, fresh and vibrant, the resort re-opened their doors in June 2018. Your luxury experience starts as soon as you fly into Sicily. The impressive mountains and stunning coastlines will take your breath away. 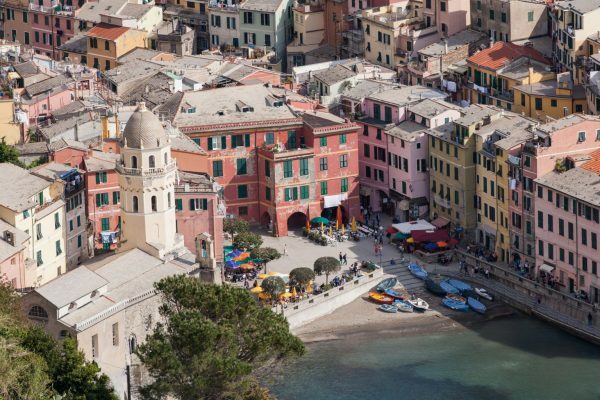 From the airport, it’s around 1,5 drive to Cefalù bay, where the Club Med resort is located. 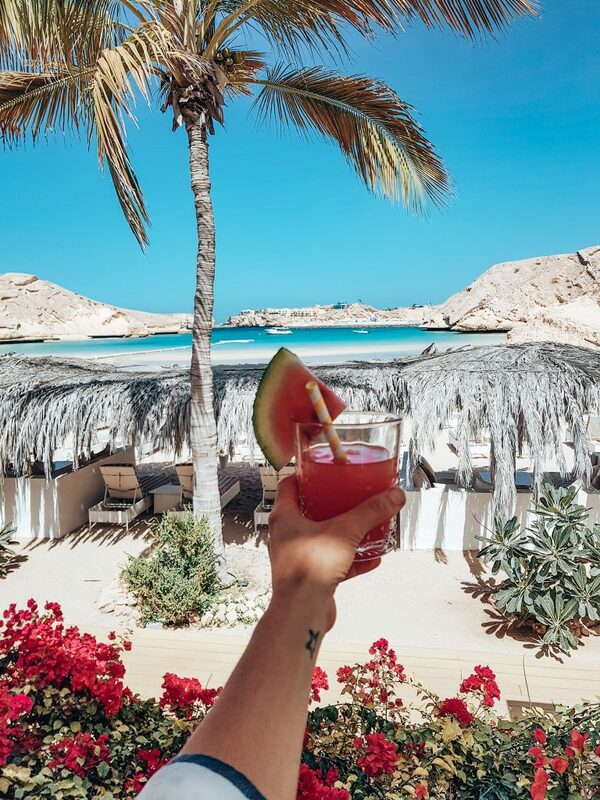 You are welcomed Club Med style, with an introduction, refreshment and positive vibes by the staff. They will treat you like royalty over the course of your stay. They will treat you like royalty over the course of your stay. People tend to go to a Club Med resort because they want to relax and not think about their busy life back home. 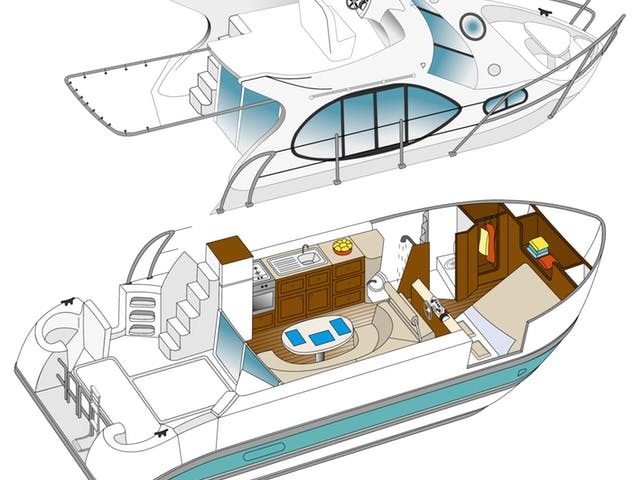 But apart from the resort, Sicily offers a wide range of activities. 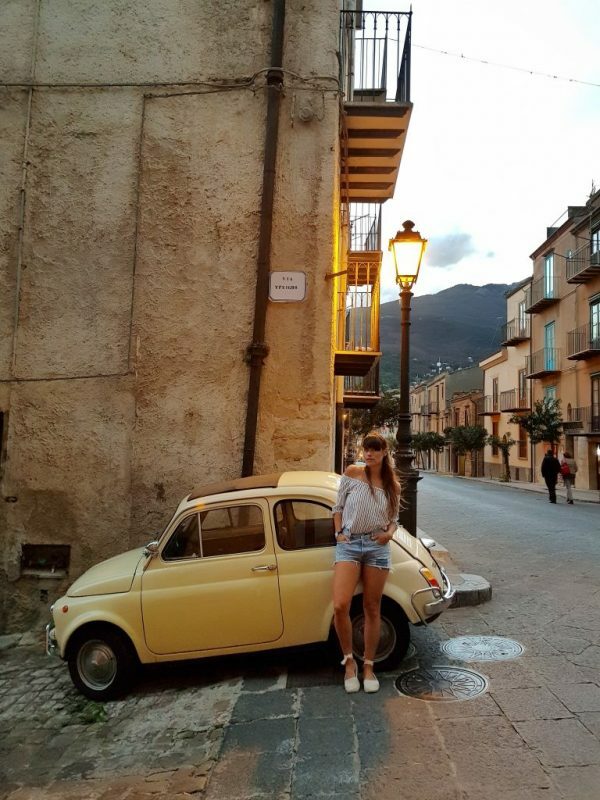 For example; we hired a Fiat 500 and drove up the mountain to one of the oldest wineries, that used to be a hiding place to one of the most legendary mafia bosses of the island. 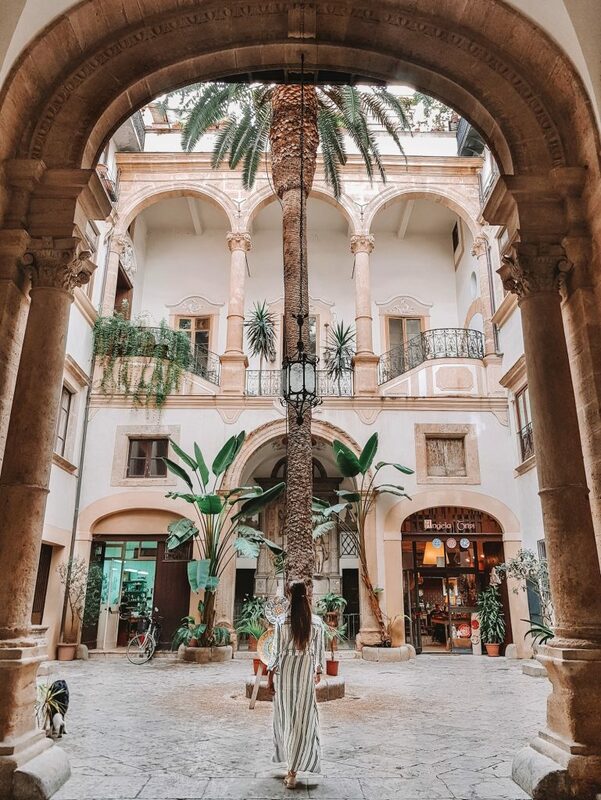 You can also take a day trip to Palermo, Sicily’s capital, which is full of history and culture. 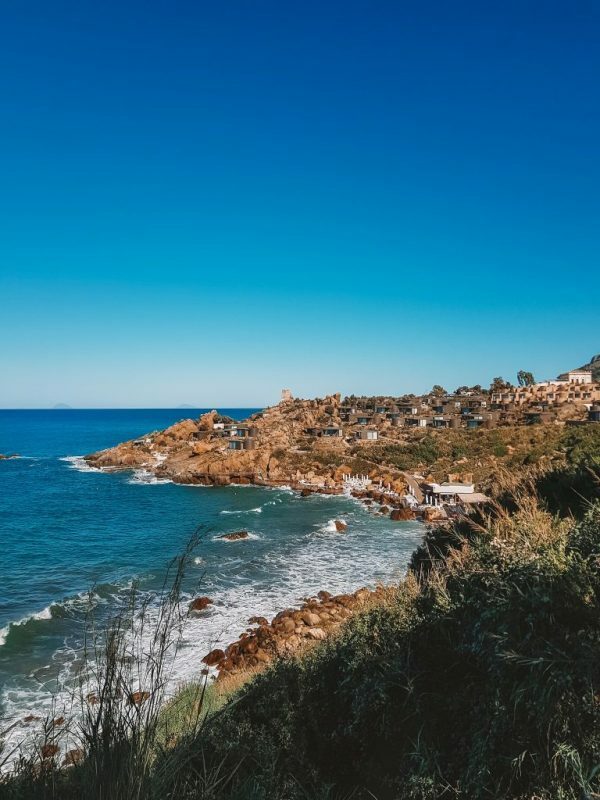 For a more local experience, you should really visit the town of Cefalù or Castelbuono. Eat at one of the traditional restaurants, or try locals treats such as Panettone. One of the things you gotta love about an All Inclusive concept is the food & drink. And Club Med Cefalù knows how to wow it’s guests with their food choices. 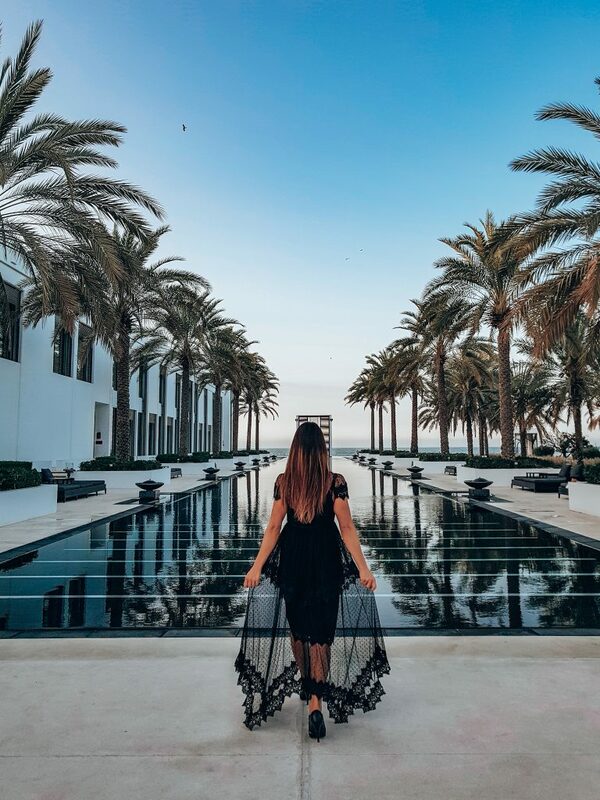 There are three restaurants and 4 bars to choose from; La Rocca, the main buffet restaurant, Palazzo Gourmet Lounge for local Sicilian flavours, the seafood restaurant located next to the water. If you want to have a lay in, just use the breakfast room service (tried & tested). Club Med wouldn’t be Club Med if they didn’t have something going on at the pool bar. Learn the Club Med dance, participate in a music quiz, or taste the new cocktails on offer. 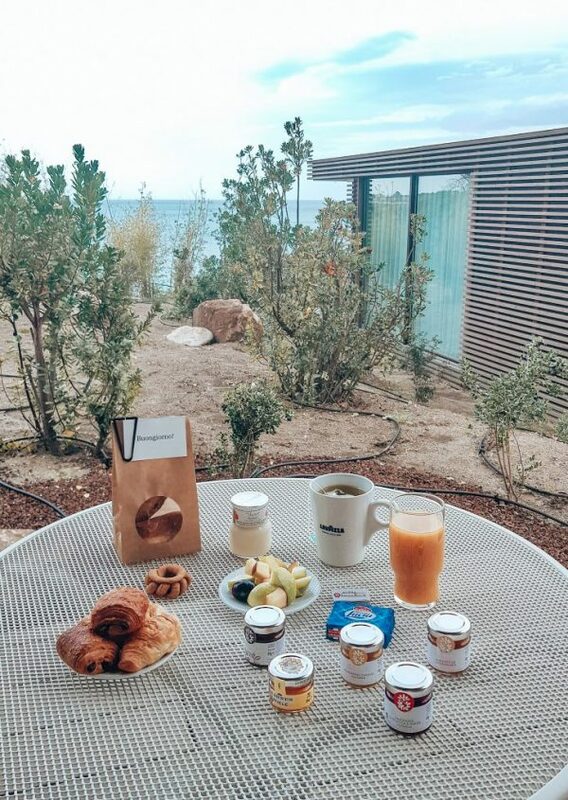 Breakfast delivered to your room? No problemo! The resort is quite big and widely spread out, so there are buggy’s to take you around the premises. (I admit calling for one a few times when I was running late for dinner). Club Med Cafalù offers a Spa by Carita to pamper yourself with a massage of facial. All products used are from the Carita brand which is high class. For the active individuals there is a tennis court, a gym with daily classes (free to join), a sup and kayaking area and snorkling. I opted for some supping which never fails to disappoint. 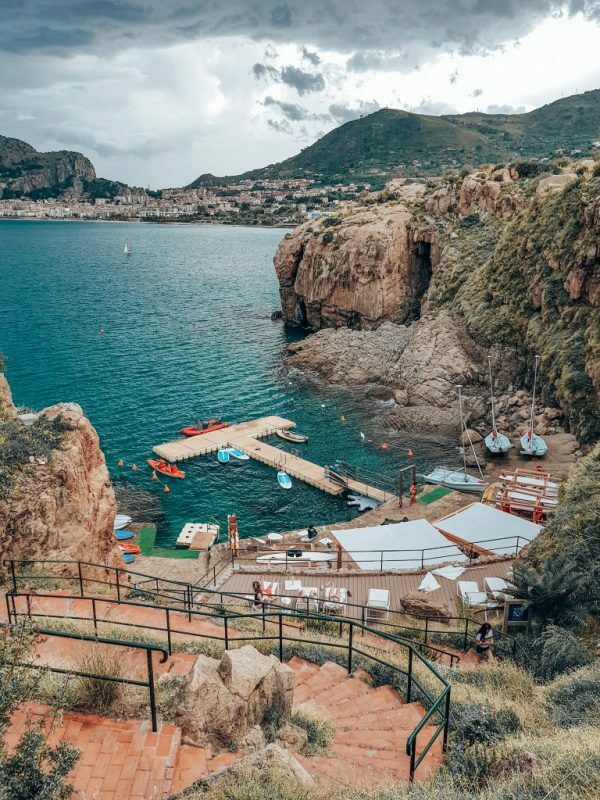 This water area is located in between the rocks and overlooks the pretty town of Cefalù. There are different rooms available; but all accommodations have a natural look & feel to them. I stayed in sea view deluxe villetta with a huge bath in the middle of my bathroom, a rain shower, a super large bed and an outside patio. Rates start at just €1000,- per person which includes your flight, accommodation and food & drink (as much as you want) for 4 nights! The resort opens back in April, so get booking! We celebrated international women’s day so a good reason to highlight some amazing women who inspire us to the max. 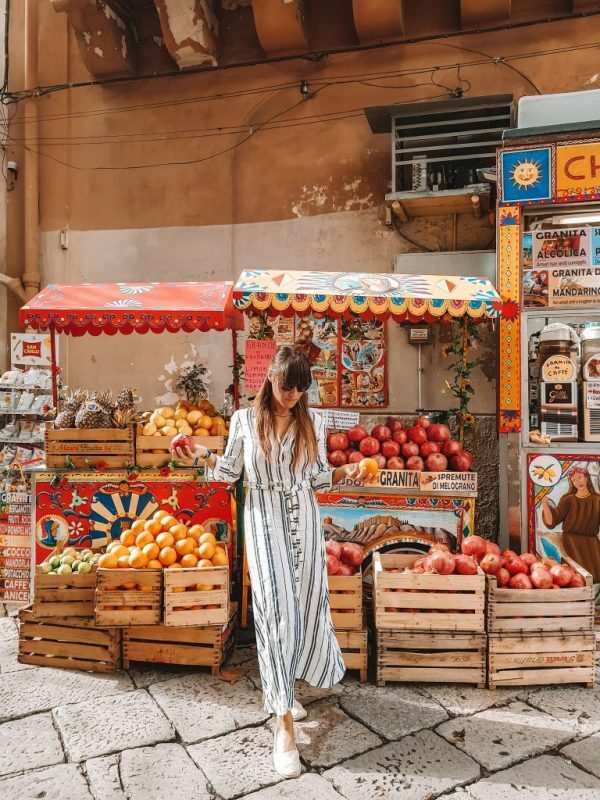 We are so happy to see more and more independent females who pack their bags and travel around the world to show us that it can be done no matter what age, size or background. 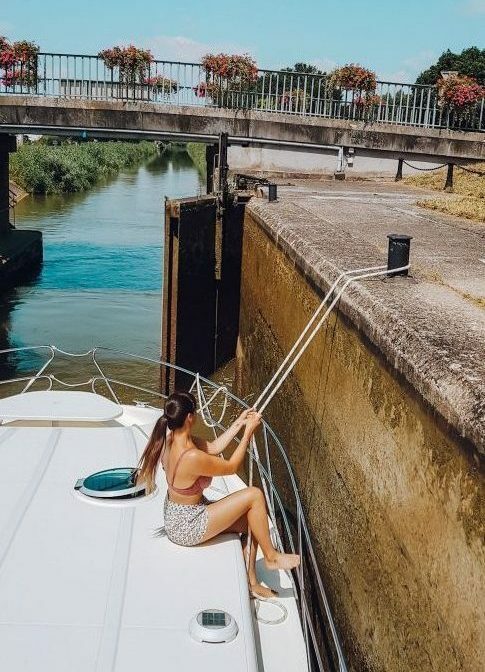 There are too many amazing women to mention them all but we’ve picked 5 badass travel chicks that we feel set a great example of what a strong female represents. 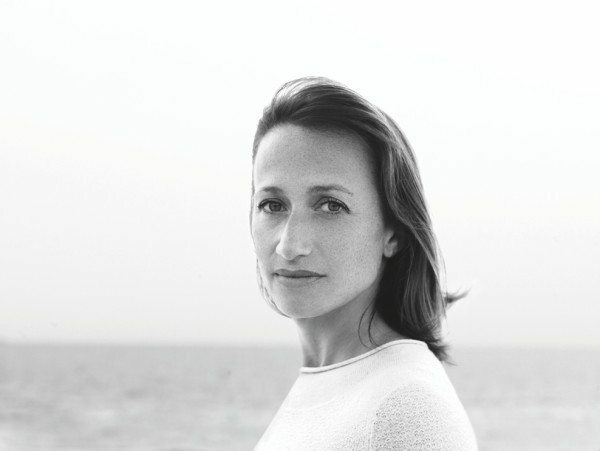 She’s a filmmaker, diver and most of all an explorer. Born in California and raised in France, she has certainly seen the world. Celine inspires people all over the world with her documentaires about humanitarian and environmental stories. She speaks 3 languages fluently and uses her voice as a public speaker. Besides all this, she is also a mother to a son. This woman has power! 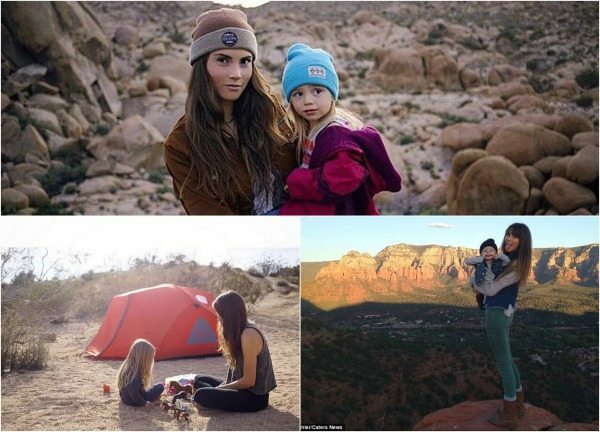 She’s the most famous traveler from the Netherlands. She has seen the whole world from Amsterdam to Greenland, Japan, The North Pole and even North Korea (she and her TV crew are one of the only ones that were allowed to film there). 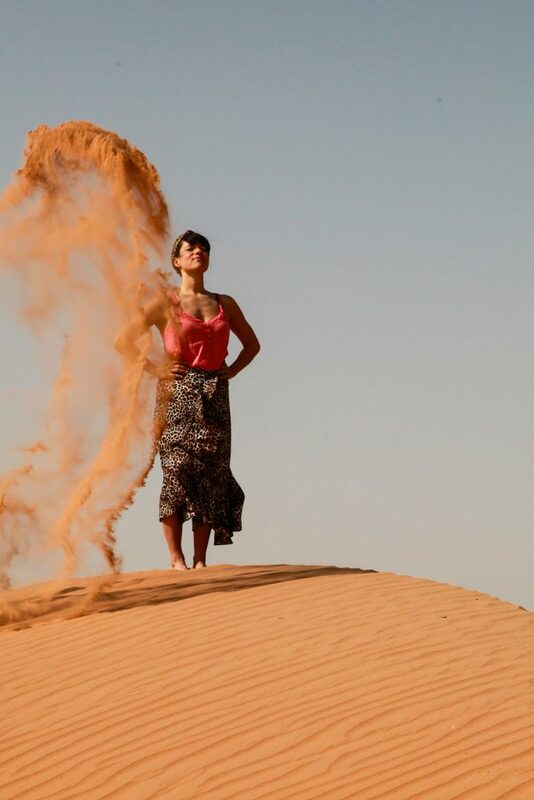 In total she has visited more than 120 countries and for her latest television show she is visiting Dutch people who live in remote places around the world and the TV program scores high! Besides all her travels, she also gives a lot back and she started a fair-trade sustainable clothing store called Nukuhiva. 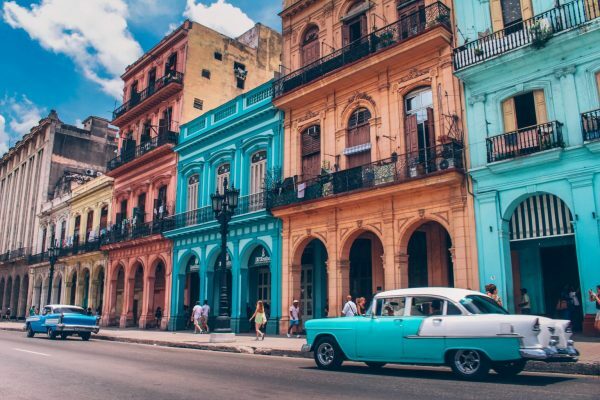 This woman is far from being done with traveling and we love her for it! Everybody told her she couldn’t do it and she proved them wrong. 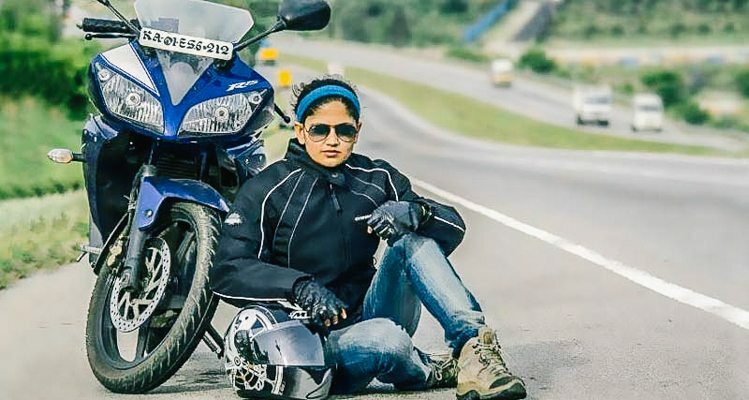 She became the first woman in India who drove all the way from Kanyakumari to Kashmir with on her motorbike. The 5452 km long road was dangerous and the trip was long but that didn’t hold her back. Armed with pepperspray, the 26 year old, took on the challenge and finished the journey. You go girl! In December of 2018 Mick van Zadelhoff and Bob Rekelhof, decided they wanted to do something that’s bigger than themselves. 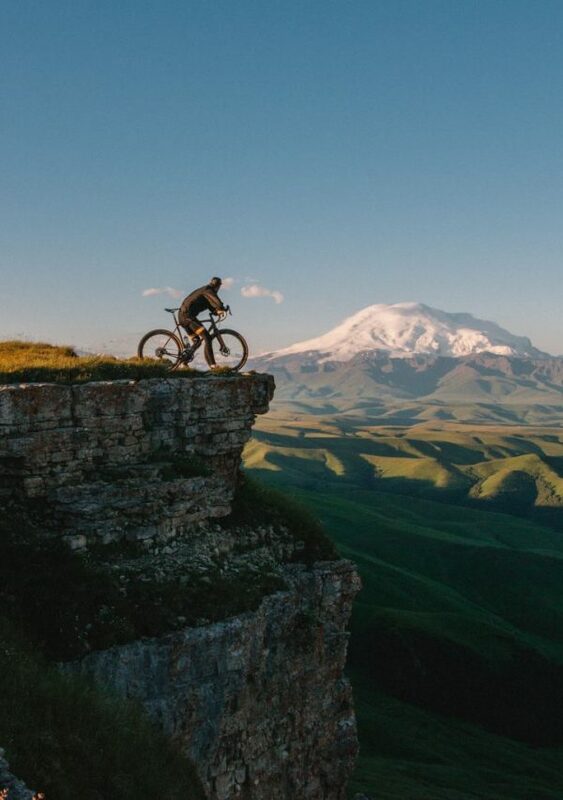 Inspired by movies like ‘Into the Wild’, they wanted to cycle from The Netherlands to India and go on a journey in which they would connect with their inner selves and other people from all around the world. This is their story. 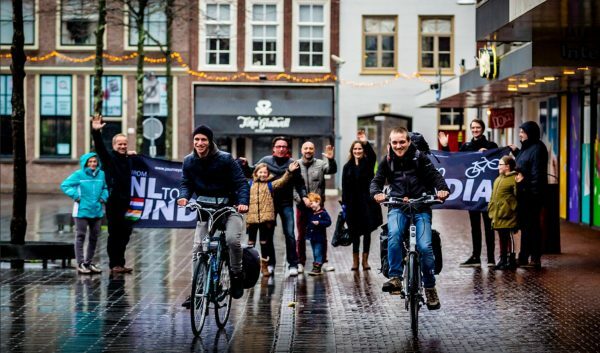 It sounded as a great idea: cycling from the Netherlands to India. We would show everyone that it’s possible to do the impossible. So, without training and without a plan we bought some bicycles and started our journey. That’s why we came up with the idea of cycling to the spiritual land called India. We bought a bike, some warm clothes and a backpack. Within just two weeks we would be cycling towards the other side of the world. The image how we imagined sleeping in a tent. The reality was a little different..
After the first week we had in mind that we would at least be used to sleeping in a tent with temperatures below zero. That was not the case. We slept terrible and our bodies became weaker. We wanted it to be this journey of connection, but it was hard to connect with people feeling this way. We needed a warm place and a good night rest. We decided to try Couchsurfing. This way we can connect with someone and have a warm couch/bed. This way we met a mother of two children, who took us out to have some drinks with friends. It was truly an amazing time we spent there. She just invited us to her night out and then into her house, where we eventually had breakfast with her and her two children. We used Couchsurfing some more times, which was always a great way to connect with people. There was only one downside: you constantly fall in some social event where you usually have some drinks and sleep late at night. We still use the platform, but not every day. Sometimes you need some goodnights rest. After two weeks we finally approached the Alps. Our last stop before climbing the steep mountains would be an Airbnb not so far from Kempten. Our plan was to sleep well and approach the mountains with fresh energy. But then… my bike broke. One part of the gear had broken off. That was the last thing we’ve expected to happen.Thank god for those tie-wraps we brought! Problem solved? Nope, when we headed towards our Airbnb, another situation occurred. I got myself a flat tire. That, we couldn’t fix at night. Because of the whole situation, we could not get to our Airbnb. Unfortunately Kempten was too packed with snow to pitch a tent. We decided to sleep in a parking garage. With sunglasses on and earbuds in, we laid to rest on the top-floor of the parking garage staircase. Not that comfortable and, also, not that warm. After some breakfast we still had to get ready for our trip over the Alps. That was the part we were really scared off. Climbing 1.000 meter high mountains with a bike in cold weather didn’t sounded that great. But we had to. Because of all the problems we already encountered, we just wanted it to be over with. We began cycling..
It’s a miracle! The sun was shining, the roads were not so steep and the sight was beautiful. The first day in the Alps seemed really easy. We sat down at a coffee place and relaxed. We only had to bike another 30 kilometers and we would arrive in Garmisch-Partenkirchen, where a fresh Airbnb was waiting for us. In a state of ecstasy we drove towards the little Tiroler town. We drove up the mountain, when Mick suddenly stopped. “We missed a turn at the last exit”, he said. We drove back another 5km to find the correct exit. Because of the snow, we had to walk through it. We walked for around 30/45 minutes and then things started to take a turn. The bicycle lane suddenly stopped. The rest of the road was hidden underneath a 1,5 meter thick layer of snow. We really felt miserable. We had to walk back all the way, bike up again the same route and take the motor way for another 40 kilometers. Night had fallen. The temperature had dropped to 15 degrees below zeroo but we were still cycling through the Alps. The day that seemed so easy to start with, had become another day of hell. We were cycling uphill for another 10 to 20 km, which turned into a freezing cold experience when we had to cycle downhill. My beard had even frozen. It was filled with little chunks of ice. However, we had to continue cycling. There were so many moments where we just wanted to stop. It was not healthy going through so much misery. But you can’t stop. There is nothing there, except for mountains and trees. You are forced to continue. Then, at one point, this survival instinct kicks in. It starts to feel like a matter of life or death. We decided to just turn up the tempo and start cycling as fast as we could. Within forty minutes we finished the last 15 kilometers. We arrived in Garmisch-Partenkirchen, where we finally had a bed, a shower and a warm cup of coffee. Some of you might be reading this and think: “Why would you do this to yourself? I would never put myself through so much misery”. We understand. To be honest, if we knew what this journey would bring, I would’ve probably not even started. After all, I’m happy with every moment, every emotion and every thought this trip have brought me so far. It made me realize how strong I am as a person. Most of the situations we’ve been through sounded as something impossible, not humanly possible to do. Now I found out that I am able to do this. First I worried about school, about a career, about my friends, about my looks. Now, that has all vanished, because… if you can ride 115 km through the Alps during mid-winter, then what else can possibly break you? Mick and Bob are currently cycling though Italy, follow their journey on YouTube!